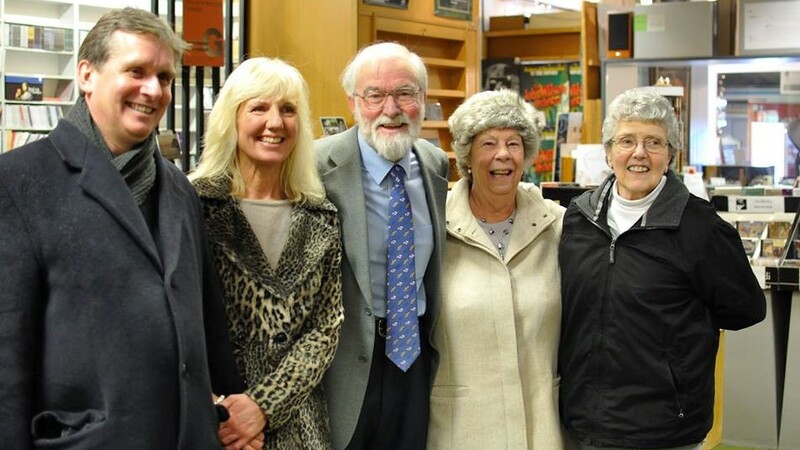 It was wonderful to welcome so many people to the shop and hear their stories. 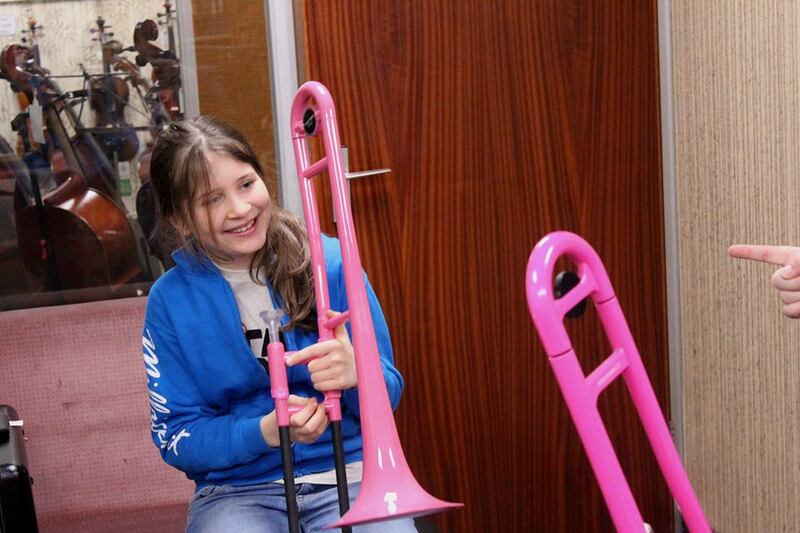 For some it was a dream come true to have a go on an instrument they'd always wanted to try. 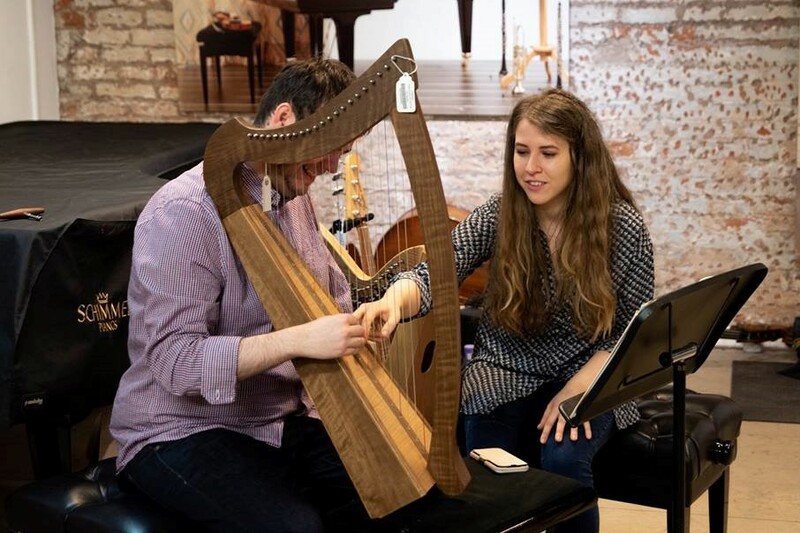 For others it helped them overcome the practical or psychological barriers associated with starting a new instrument or returning to one they used to play. And for many children and their parents it was the perfect way for them to try out several instruments before committing to a course of lessons at school. It was lovely to be back at the Royal Northern College of Music for their annual festival celebrating chamber music in general and, this year, the innovations and ongoing influence of Joseph Haydn in particular. 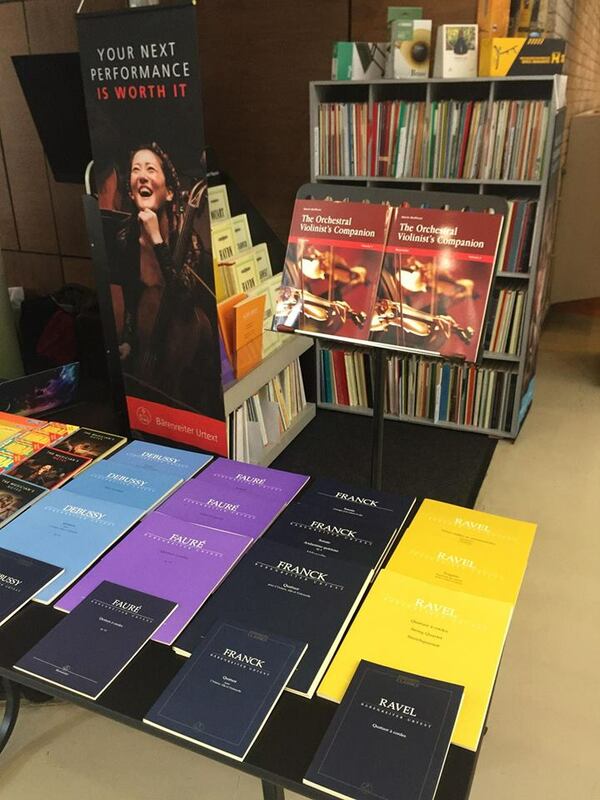 We took along our own pop-up shop of sheet music, instrumental accessories and gifts, and represented leading international publishers G. Henle Verlag and Edition Peters, offering special discounts on their beautiful Urtext editions of the Haydn string quartets, which were featured in different programmes throughout the Festival. 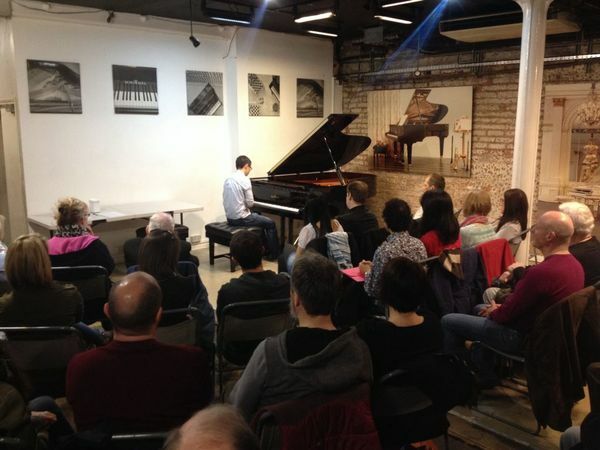 Once again, a capacity crowd of 50 converged on our basement to share two hours of wonderful piano music. 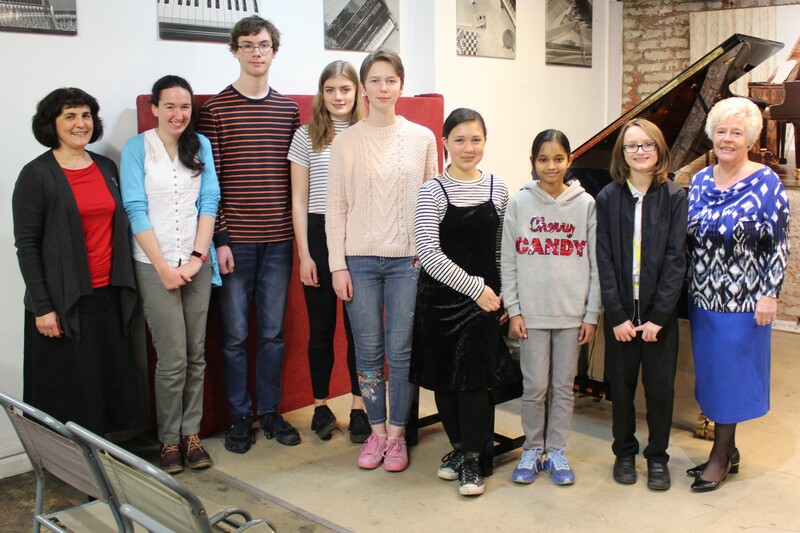 About half the members of this meetup group got up to perform on our 9-foot Schimmel grand piano, contributing to a typically eclectic programme of Bach, Handel, Scarlatti, Arne, Krebs, Beethoven, Chopin, Moszkowski, Satie, Scriabin, Rachmaninov, Confrey, Sondheim, John Williams, Elena Kats-Chernin, Miguel Astor, Catherine Rollin and Yann Tiersen. We were very excited to be involved in the very first Manchester Vocal Weekend at Chetham's School of Music: two days of workshops, masterclasses and recitals, led by award-winning baritone and former Chetham's student Marcus Farnsworth with soprano Ruby Hughes and pianist Joseph Middleton. 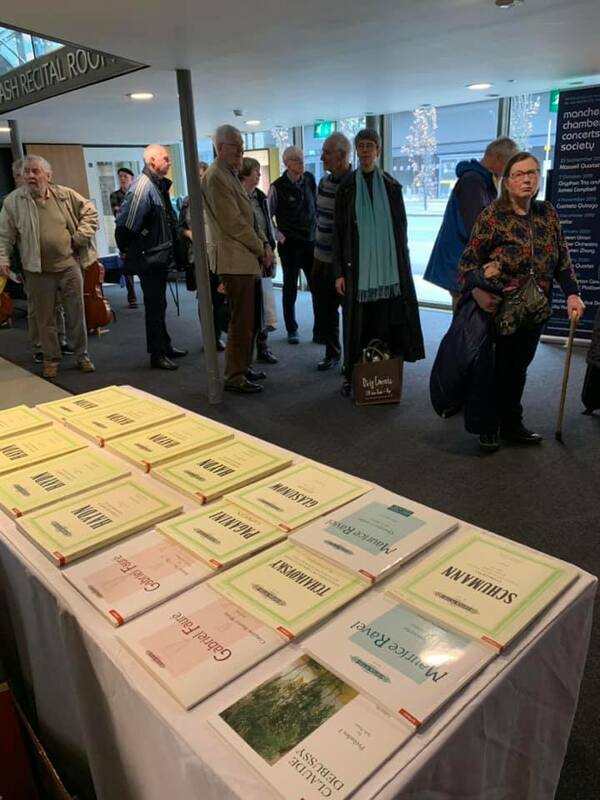 Participants enjoyed special discounts at our pop-up shop of solo vocal and choral music and accessories, including 15% off the scores used for the opening event, Come & Sing Haydn’s Nelson Mass. 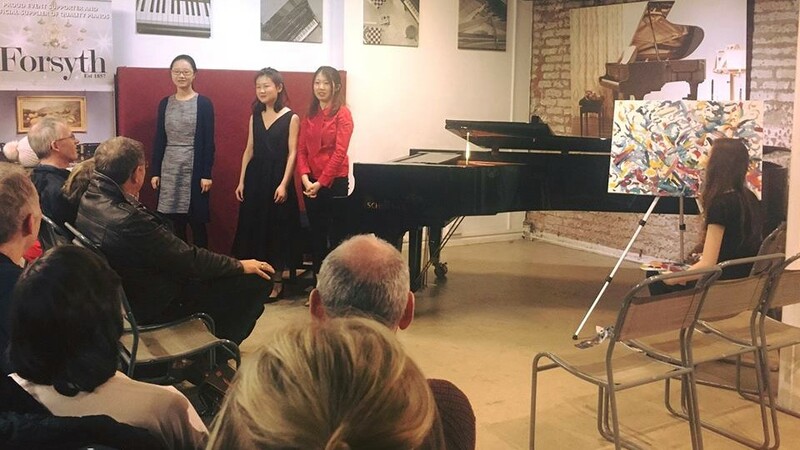 We were pleased to be able to help students from the Royal Northern College of Music – pianists Fangbin Xia, Xinnan Pu and Yilan Zhou, and singer Soph Taylor – raise money for Manchester South Central Foodbank by providing venue, piano and marketing support for a wonderful charity concert, which was particularly memorable for being live-painted by Caroline Bordignon! 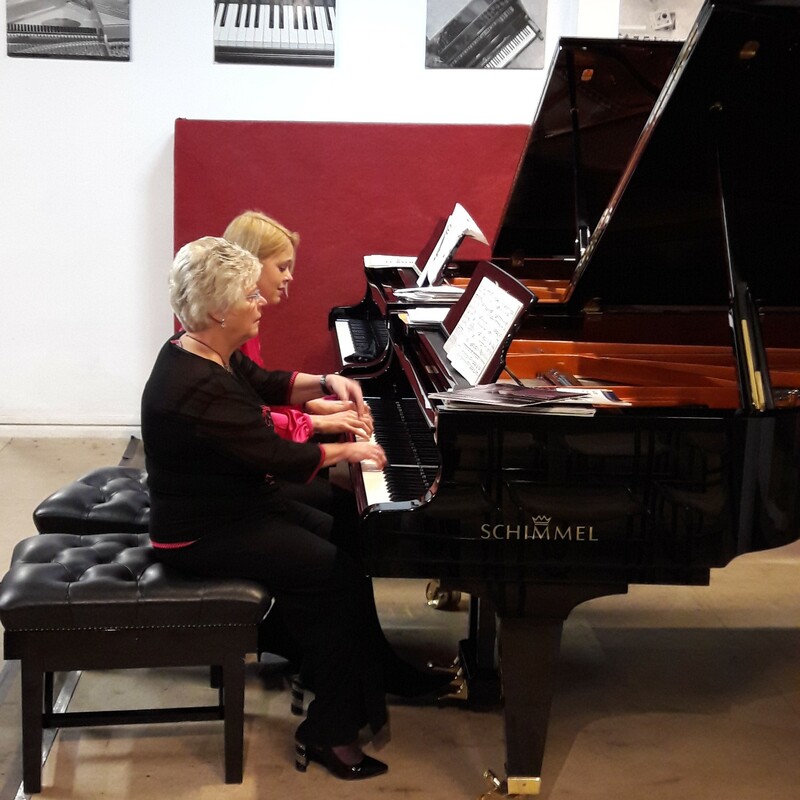 This wonderful workshop was a rare opportunity for pairs of pianists – playing either piano duets (four hands, one piano) or duos (two pianos) – to work on a piece with two specialists in the field, Susan Bettaney and Amy Wakefield of the European Piano Teachers Association. 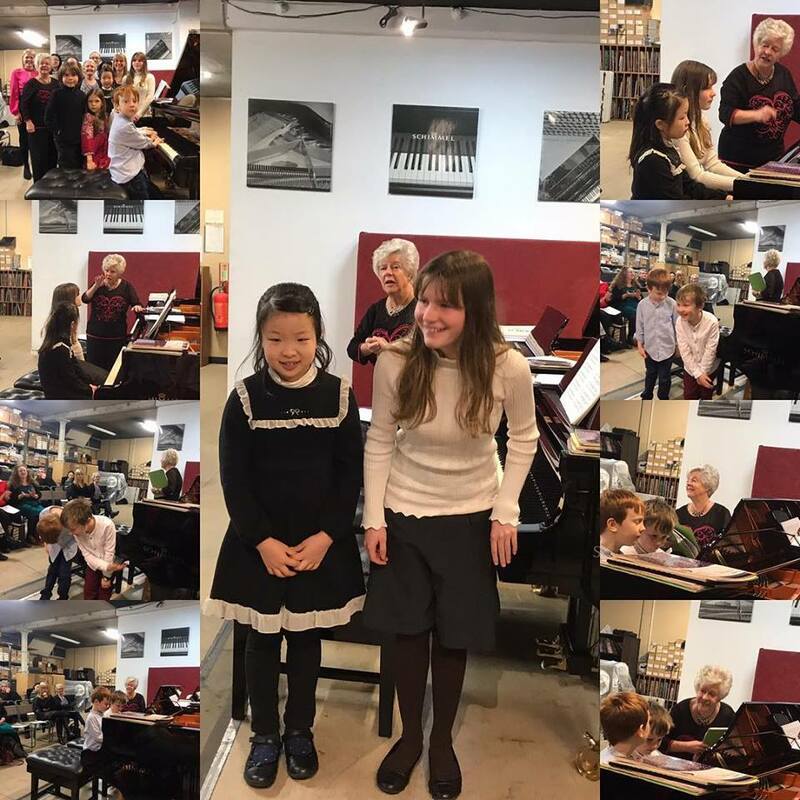 Players ranging from children as young as five to professional piano teachers offered four-hand pieces by Schubert, Grieg, Fauré, Moszkowski, Walton, Leroy Anderson and Christopher Norton, as well as a two-piano arrangement of Mendelssohn's Rondo Capriccioso. 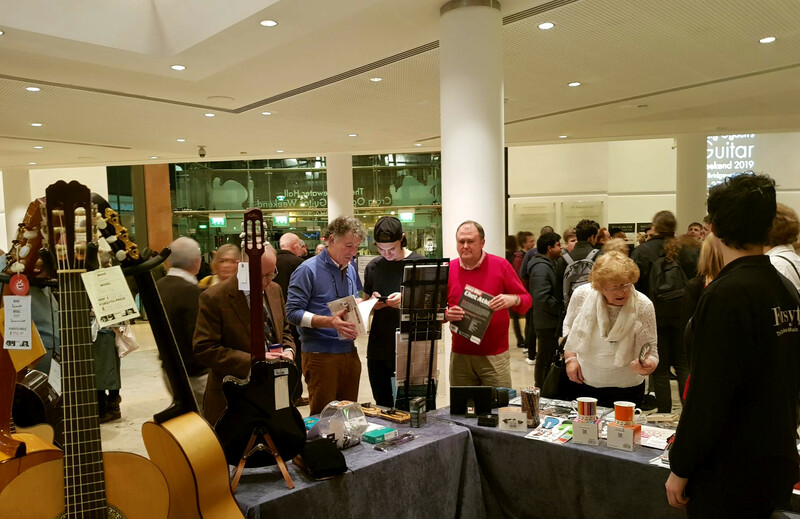 We were delighted to be invited back to the Bridgewater Hall for Australian guitar virtuoso Craig Ogden's Guitar Weekend – three days of fantastic concerts, masterclasses, workshops, talks and film screenings attracting hundreds of guitarists and music-lovers, as well as performers like Tom Doughty, Zoran Dukić, Sean Shibe, and the Manchester Camerata. 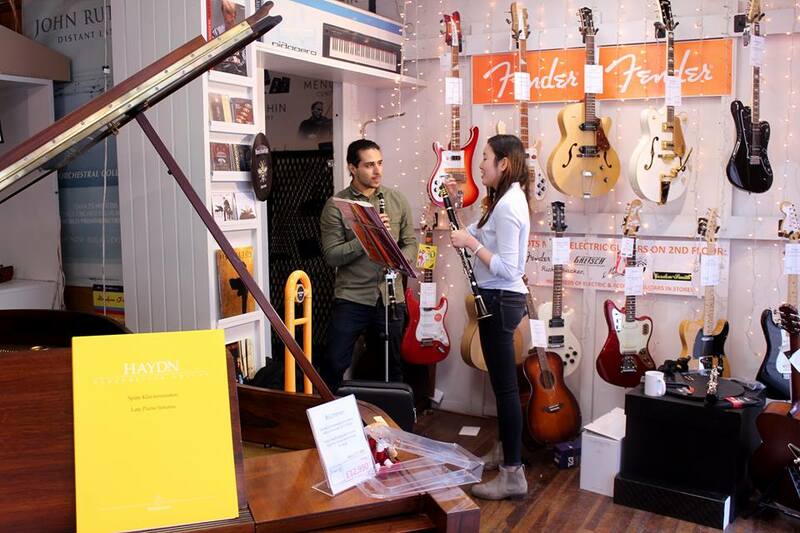 We were there with our pop-up shop of beautiful guitars, accessories and sheet music for everyone to browse, try and discuss with our expert staff. 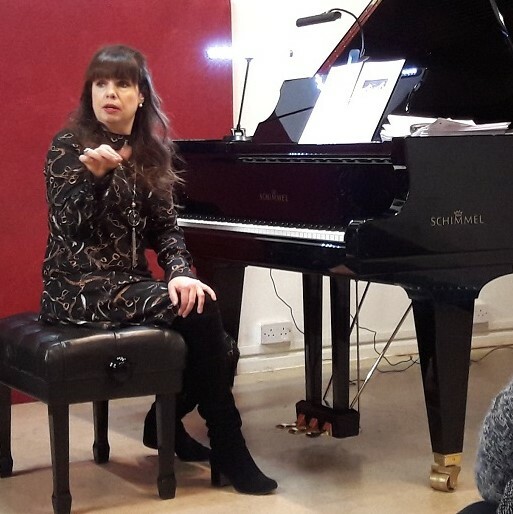 An inspiring workshop on the importance of a flexible and relaxed piano technique with Melanie Spanswick, acclaimed pianist, composer, educator, adjudicator and author. So many pianists who struggle with tension are simply told to relax but are rarely shown how, so it was eye-opening to see how a few simple yet fundamental exercises can transform not only a player's technique but also their musical expression and enjoyment. We were delighted that so many teachers, learners and parents were able to join us and contribute to the discussions and demonstrations. Melanie also presented her new series of books, Play it again: PIANO, which, while primarily aimed at those who are returning to the piano after a break, is also a perfect course for intermediate and advanced pianists, who have had to make do without modern, structured method books until now. You can read more about the series on our blog! 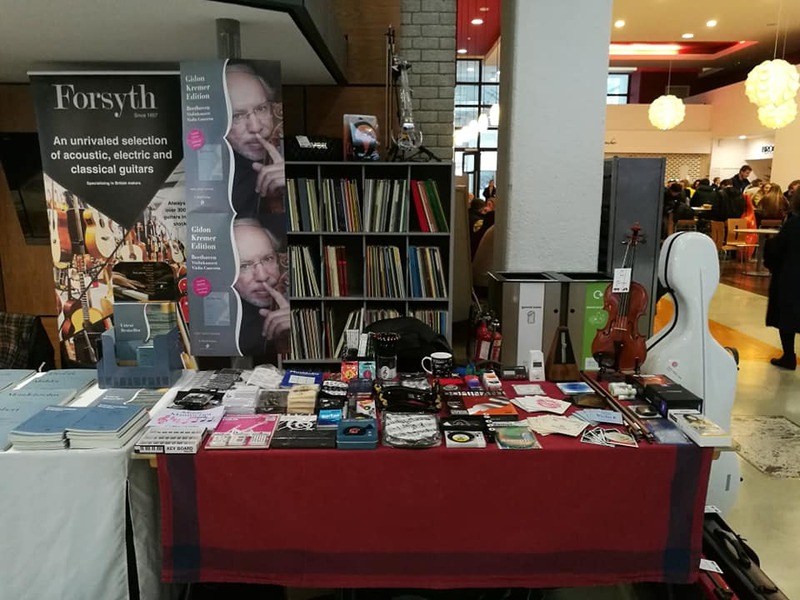 We had a great weekend at the Royal Northern College of Music's high-profile annual Strings Festival. 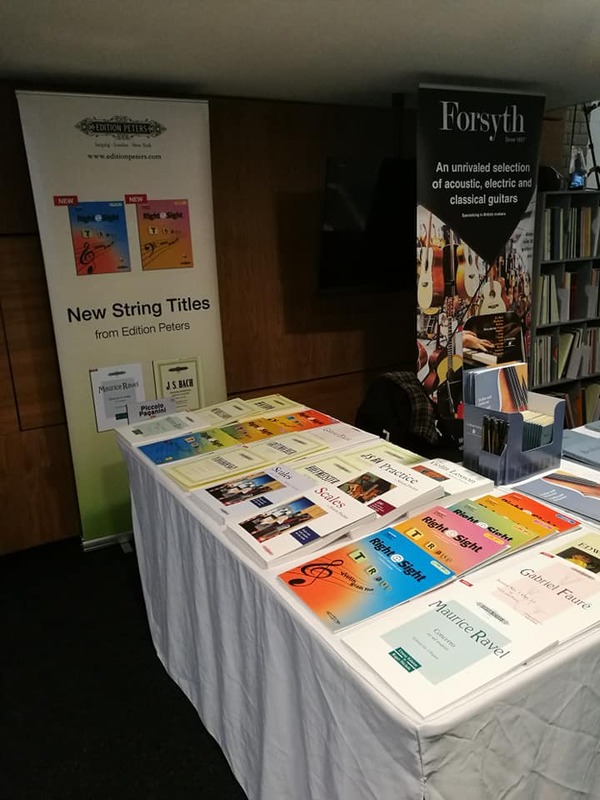 This year we were also representing leading international publishers Henle and Edition Peters alongside our own pop-up shop with shelves full of solo and chamber sheet music, plus string instruments and accessories and musical gifts. 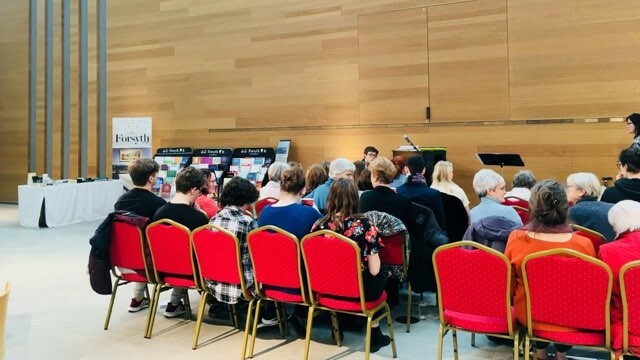 This month saw the biggest turn-out yet, with 50 pianists and music-lovers meeting to share an afternoon of live performances. The wide-ranging programme included the second movement of the Grieg piano concerto, performed on two beautiful 9-foot Schimmel Konzert grand pianos, a piano duet by Sidney Smith, solo works by Bach, Mozart, Beethoven, Chopin, Liszt, Brahms, Elgar, Scriabin and Rachmaninov, plus arrangements of songs by Gershwin, Errol Garner and Queen and music from The Godfather. 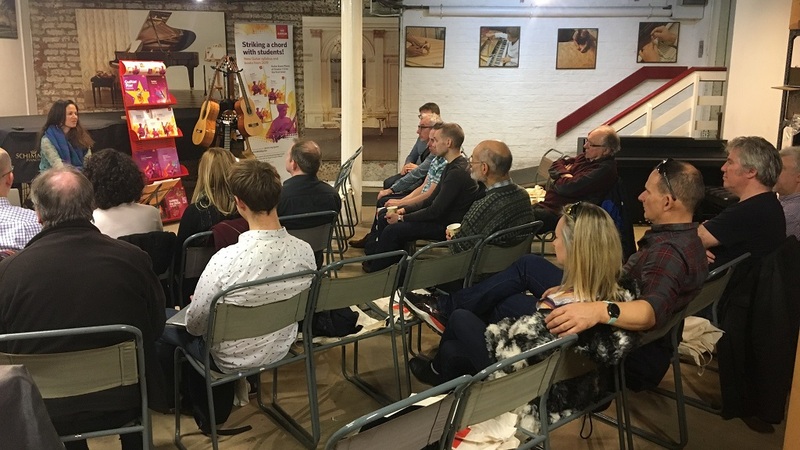 We were delighted to host the final leg of the ABRSM Guitar Roadshow, presented by Helen Sanderson, Head of Guitar Performance at the Royal Welsh College of Music & Drama, who gave a wonderful introduction to the music on the new syllabus, complete with brilliant live performances. It was great too to have such an engaged audience joining in with the discussion and asking lots of questions! This month the Meetup group Let's Play the Piano! packed out our performance space with a programme as diverse as ever: classic piano repertoire by Bach, Beethoven, Chopin, Liszt, Debussy, Chaminade and Rachmaninov, songs by Gershwin, Ray Noble and the Sherman Brothers, folk songs from the former Yugoslavia, and arrangements from Final Fantasy, Game of Thrones and The Greatest Showman. The Tea and Jam Collective were back for the second in their series of informal concerts for musicians of all abilities and styles: amateur players in the first half, and the professional Tea and Jam house band in the second, with copious amounts of tea throughout! 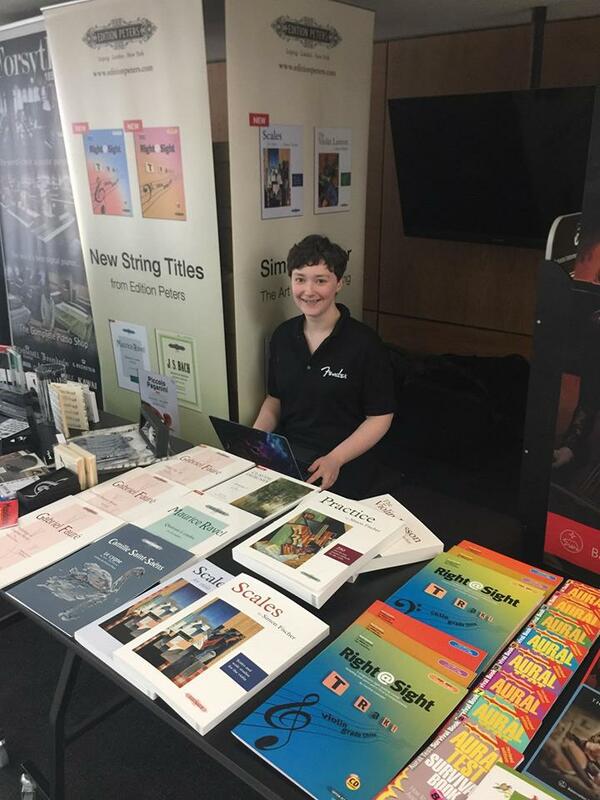 We had a brilliant few days at the Royal Northern College of Music, the University of Salford and BIMM meeting new and returning students and introducing them to our comprehensive range of products and services, not least our 10% student discounts on sheet music and accessories! This month's Meetups featured classics from Bach, Mozart, Beethoven, Chopin, Debussy, Rachmaninov and Cole Porter, lesser-known works from Henryk Pachulski and Alexander Illinsky, original works and improvisations by members of the group, plus a special performance of Linda Ronstadt's 1986 hit 'Somewhere Out There' with sign language. 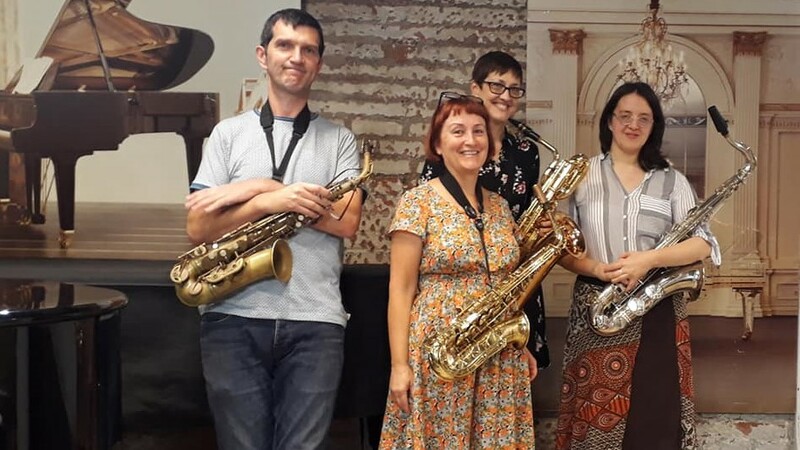 In September we welcomed the Tea and Jam Collective to Forsyth for the first in their new series of events bringing together adult amateur and professional musicians for a friendly session of music-making, with plenty of time to chat over tea! Check out the videos on their Facebook group page and join them at Forsyth (in our cabaret-style basement!) on the first Saturday of every other month! 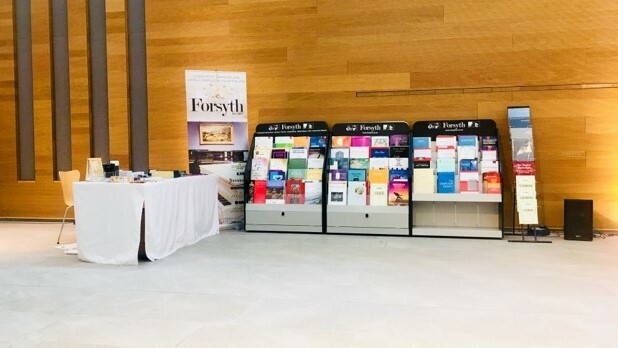 For the 11th year, Forsyth is proud to have sponsored the Chetham's International Summer School and Festival for Pianists. The prestigious annual Summer School is Europe's largest such event devoted exclusively to the piano and incorporates the International Piano Series of public concerts at the Stoller Hall, which this year featured solo recitals and concerto evenings with such luminaries as Einar-Steen Nøkleberg, Leon McCawley, Ronald Brautigam and Martin Roscoe. 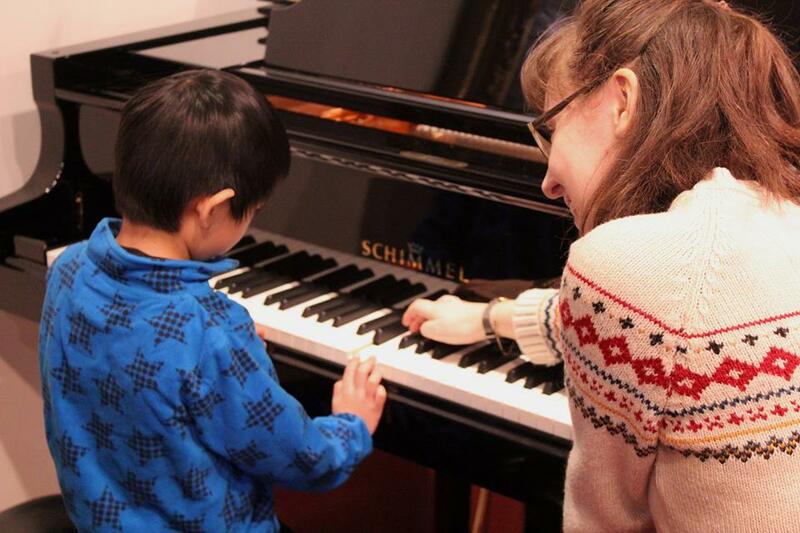 We provided over £500,000's worth of pianos for concerts, masterclasses, teaching and practice – 20 top-quality instruments by Schimmel, Yamaha and Kawai, from uprights to concert grands! 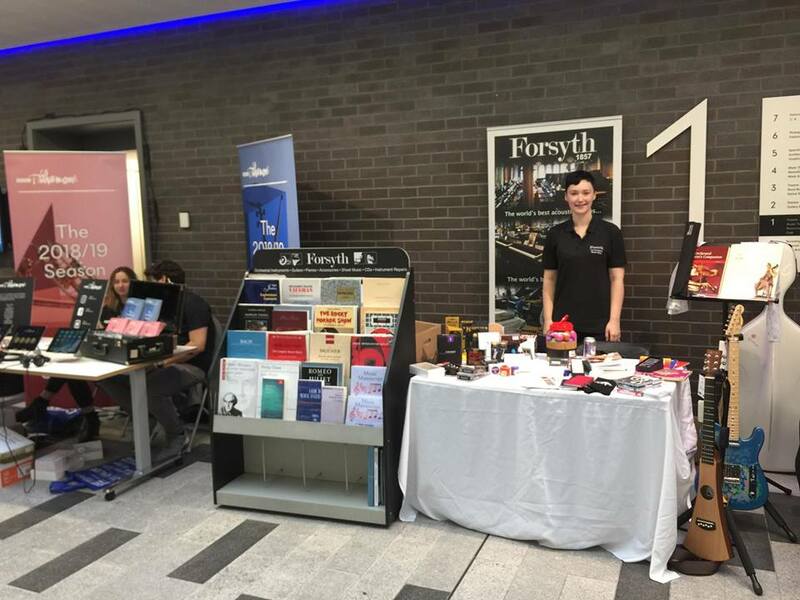 – as well as an extensive pop-up shop of sheet music, recordings, accessories and gifts in the school's Oglesby Atrium. 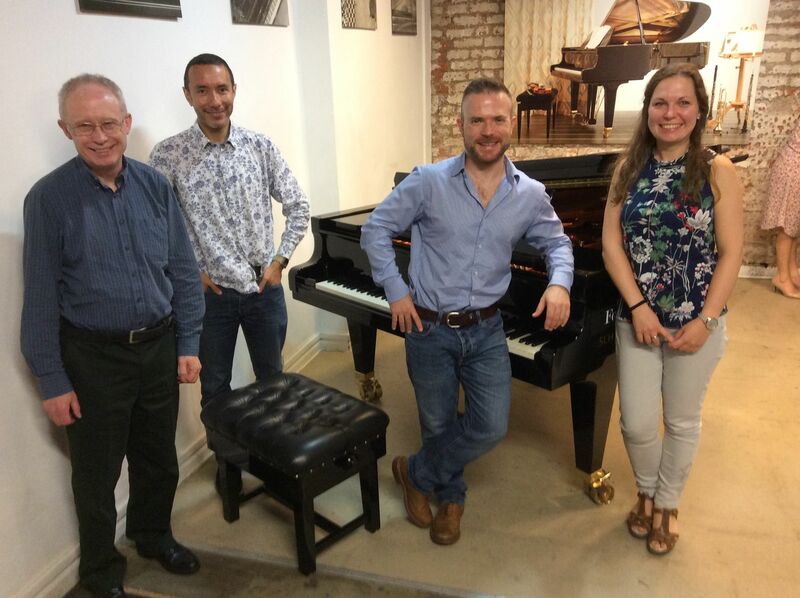 Back at our premises on Deansgate, we also took summer school participants and members of the public on behind-the-scenes tours of our piano workshops with exclusive access to our private collection of historical keyboard instruments. 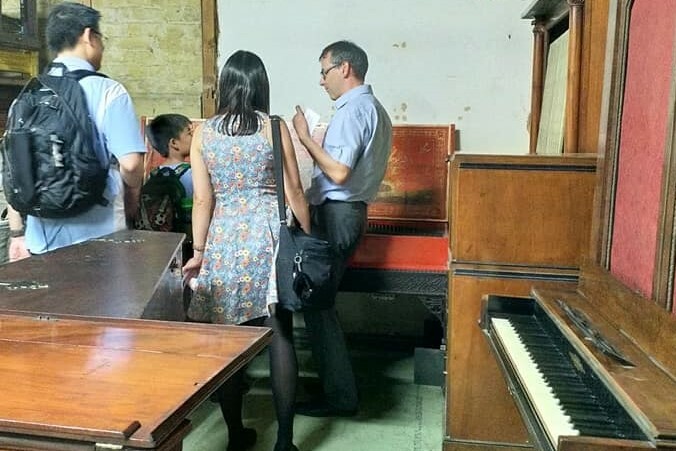 Our guests were treated to two-hour tours explaining the history of piano-making, the principles of modern piano design and construction as well as piano maintenance and repair. 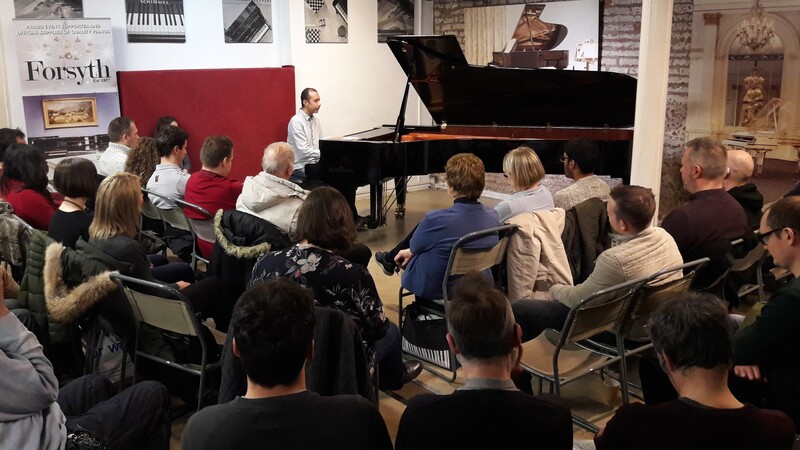 The latest session of the regular Meetup group for pianists included everything from Bach and Scarlatti, through Beethoven, Chopin, Rachmaninov, Granados and Messiaen, to Thelonius Monk, Yann Tiersen and Queen. supporting tests – sight-reading, aural, musical knowledge and improvisation. John largely focused on one piece per grade, discussing why each was chosen, what musical and technical skills it would help to develop and how examiners would approach their marking. In this relaxed and encouraging setting, members of the audience actively participated in the discussion and even volunteered to perform the featured pieces, often from sight. They were also able to discuss any aspect of the Trinity exams with Peter Buckby, Trinity's Regional Consultant for the Midlands and North of England. 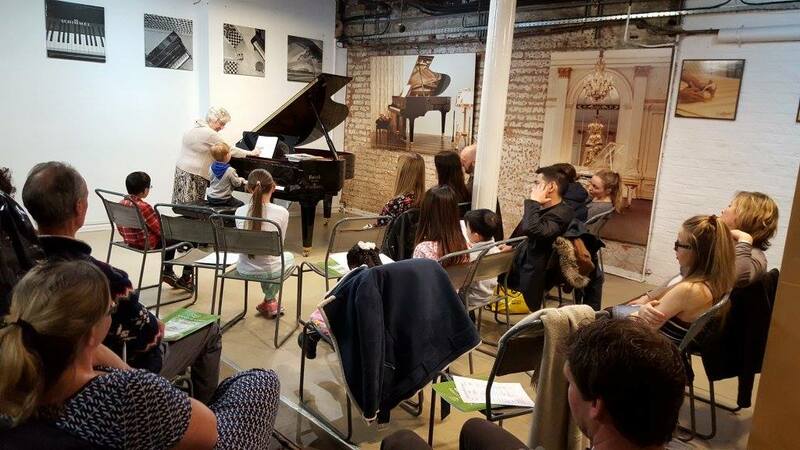 Student and amateur pianists of all ages had another wonderful opportunity to gain invaluable performing experience and expert advice from the inspiring Susan Bettaney at our second European Piano Teachers Association (EPTA) workshop of the year. 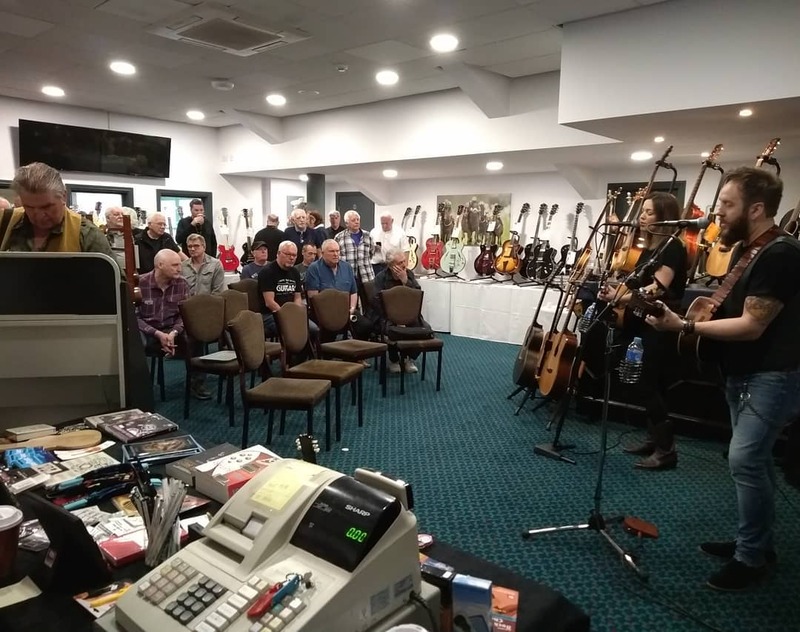 This was our debut appearance at the North West Guitar Show, one of the UK's largest gatherings of guitar enthusiasts, and we were thrilled to be curating the spacious Members Suite! We showcased highlights from the eclectic range of instruments to be found in our newly-refurbished Guitar department at our historic Manchester store. In particular, we brought exclusives from Höfner Germany, Furch Guitars, Kala Ukuleles and Haydock favourites Auden and Gordon Smith, plus a superb selection of guitar sheet music from the shop's award-winning Sheet Music department. As you can tell from the photo below, we had a great time at the Grand Northern Ukulele Festival! It was our third year at the event, which was just as brilliant as last year when it won UKE Magazine's Best Ukulele Festival 2017 award. 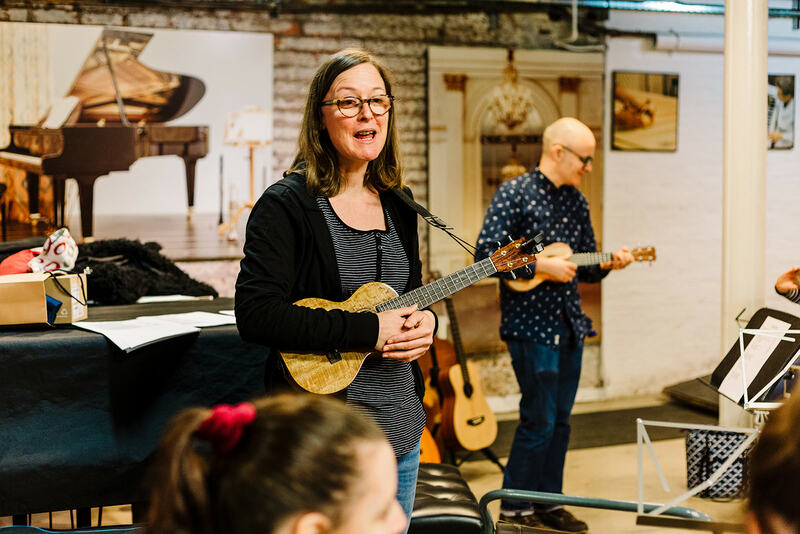 Our pop-up shop of ukuleles, sheet music and accessories included some unusual instruments and some very special offers, and was the perfect vantage point for meeting and catching up with fellow ukulele enthusiasts. April's session of the Meetup group Let's Play the Piano! 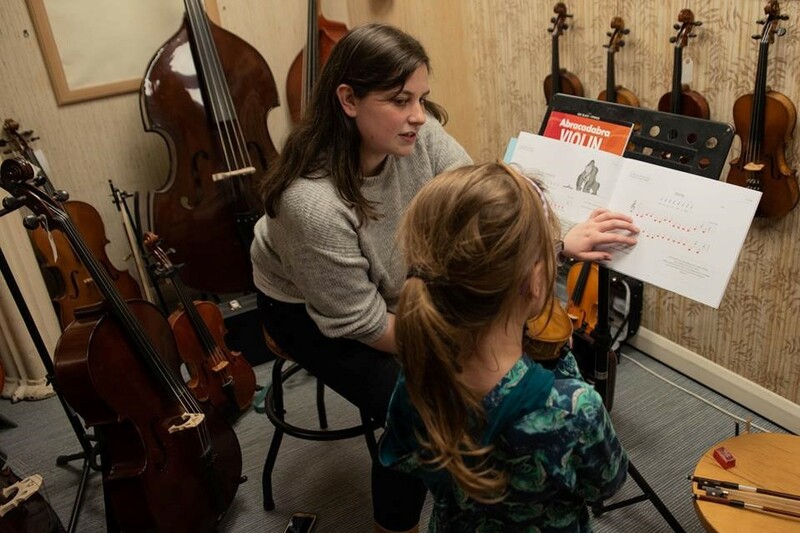 was the first in a new series of charitable events at which all attendance contributions are donated to a local children's or young persons' musical education project for them to spend as they wish on music books or equipment. In support of this excellent initiative, Forsyth has pledged to top up the group's donation by 10% in addition to providing the beneficiaries with a 10% educational discount. 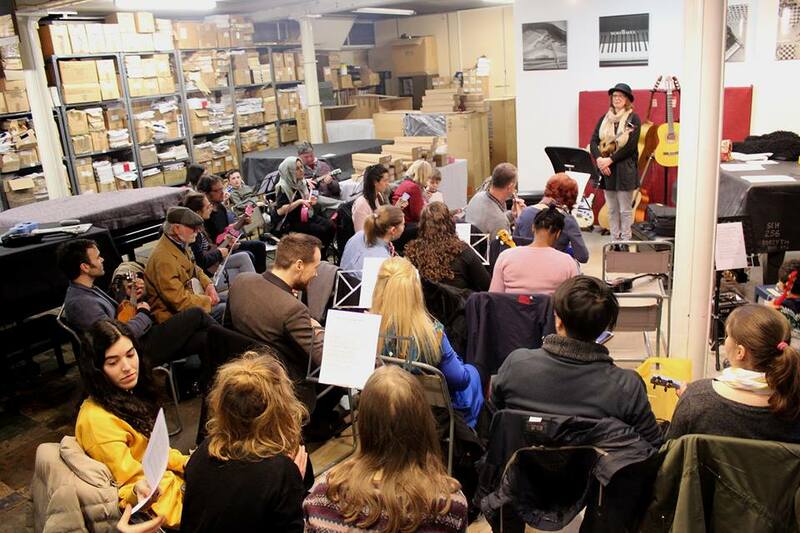 In this session, a total of £200 was raised for the Stockport Recorder College, a volunteer-run charity in Hazel Grove providing individual and group tuition in recorder, theory and aural skills to young people aged between 7 and 18 every Saturday during term-time. 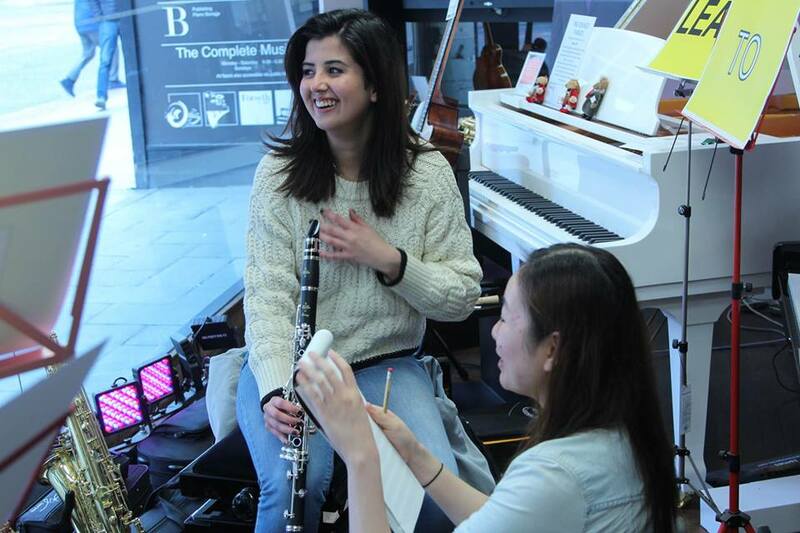 The College enables access to music education for students who might otherwise be unable to afford it and, particularly through ensemble playing, students make friends and develop confidence, many of them going on to study music at institutions such as the Royal Northern College of Music and Birmingham Conservatoire. Despite the snow’s best efforts, our Learn to Play Day weekend was bigger than ever! 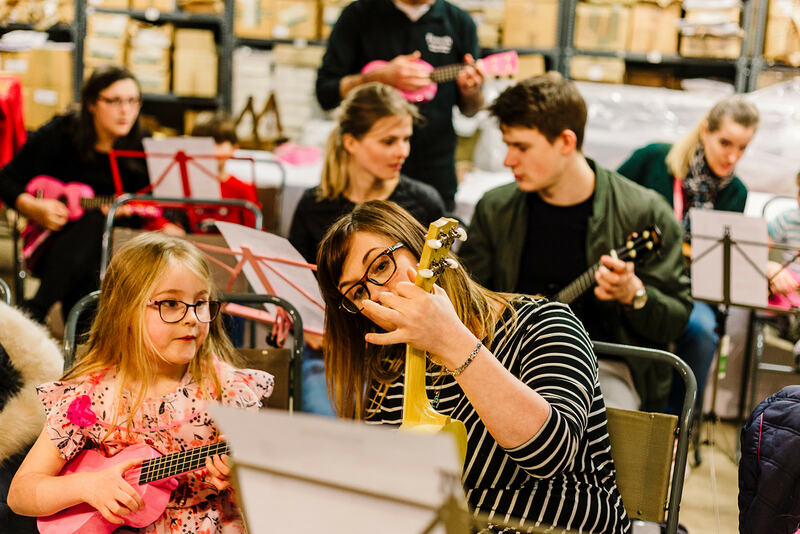 In just two hugely enjoyable days, we gave 180 free individual musical instrument lessons to learners aged 2 to 82, and got about 50 people playing ukulele in two free group sessions. 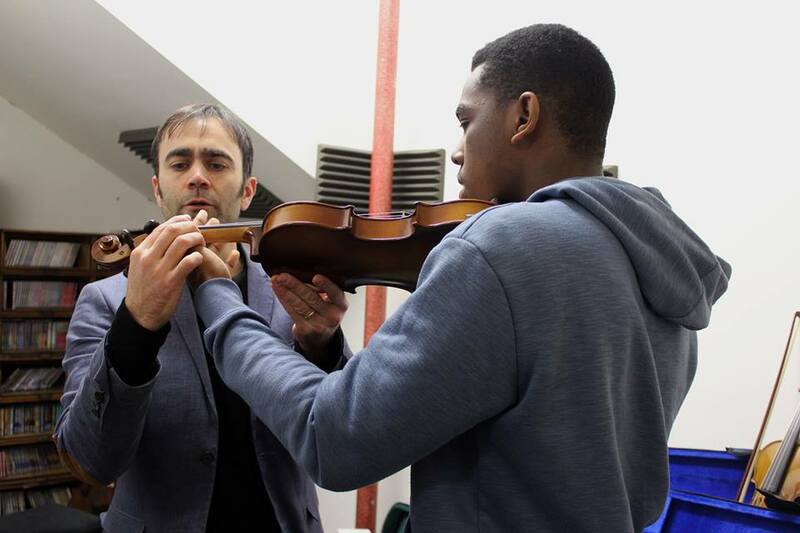 Learners ranged from complete beginners of all ages, through those experimenting with second instruments, to others who were once at conservatoire standard but were returning to their instrument after a break. 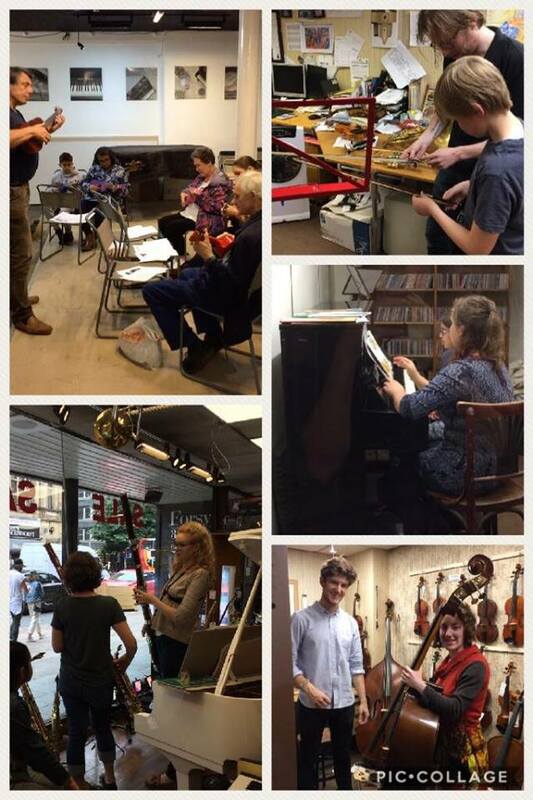 With more than twice as many bookings as last year, we were all kept on our toes and gave lessons in every available space throughout the store: offices, stock rooms, our third-floor piano workshop and the shop window, in addition to our dedicated teaching, practice and performance spaces in the basement. 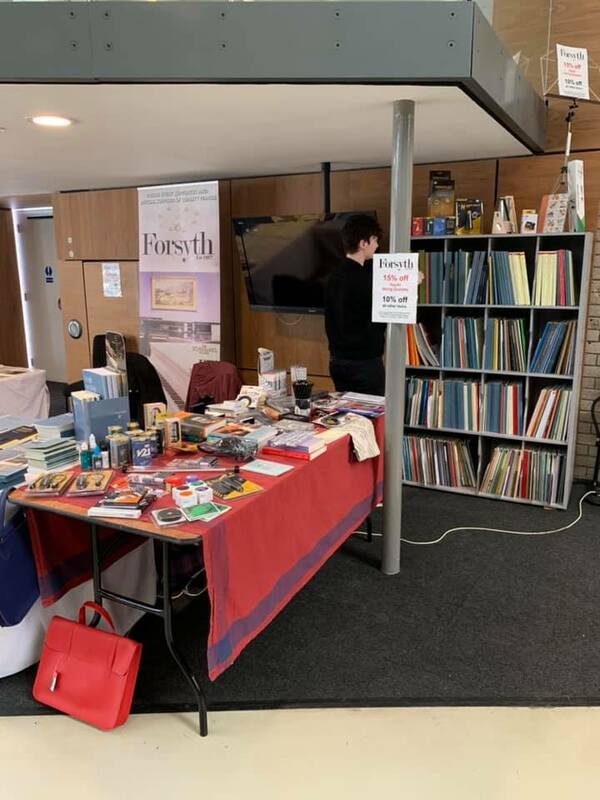 We would also like to thank ABRSM, Faber Music, Music Sales Group and Oxford University Press for kindly donating the fantastic musical stationery that went into the gift bags handed out to learners along with our own special discount vouchers. Check out our Facebook album for more photos! 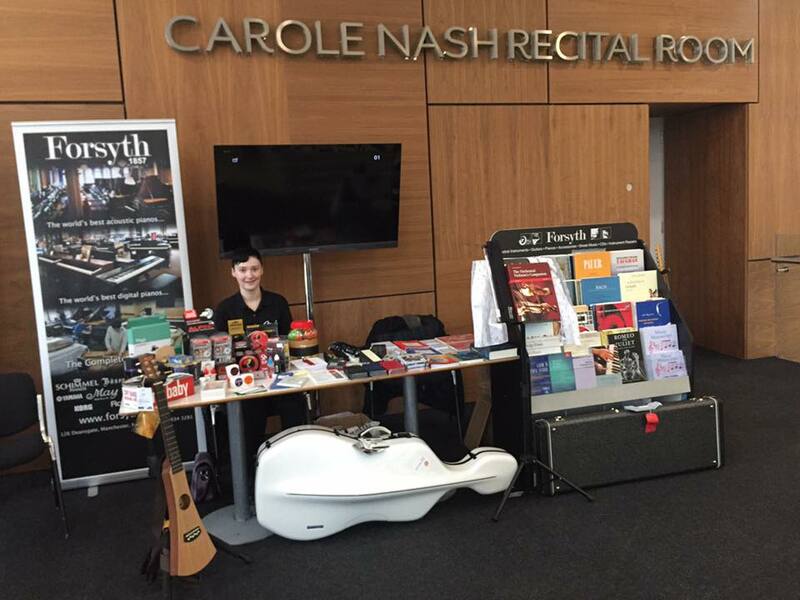 It's always a pleasure to take our pop-up shop to the Royal Northern College of Music! Their latest high-profile Chamber Music Festival, part of their French Connections season, featured performances by Quatuor Voce, Trio Apaches, folk trio Faustus and musicians from the Aronowitz Ensemble in addition to students from RNCM, Junior RNCM, Chetham's School of Music and St Mary's School. 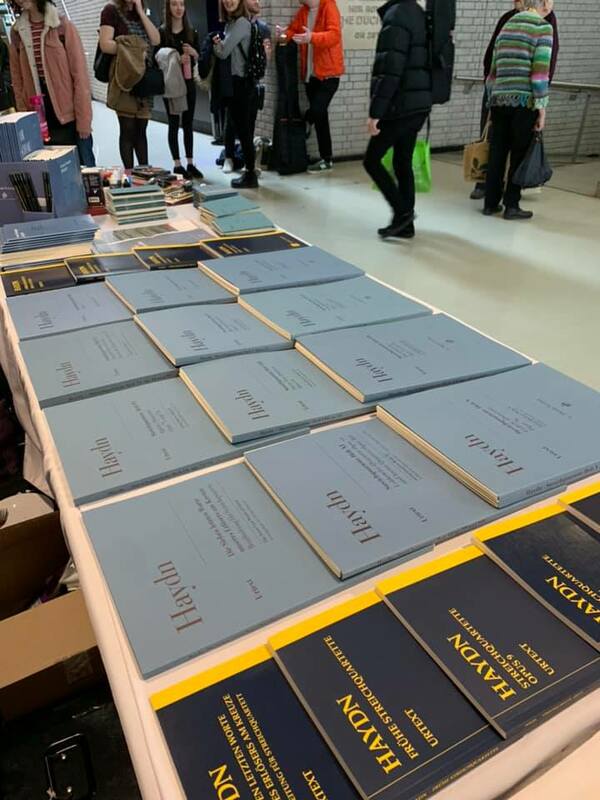 As well as taking huge range of solo, chamber and educational publications, plus a selection of instruments, accessories and gifts, we represented leading international publishers Bärenreiter and Edition Peters with stands dedicated to their beautiful, authoritative publications. This session of the Meetup group Let's Play the Piano! 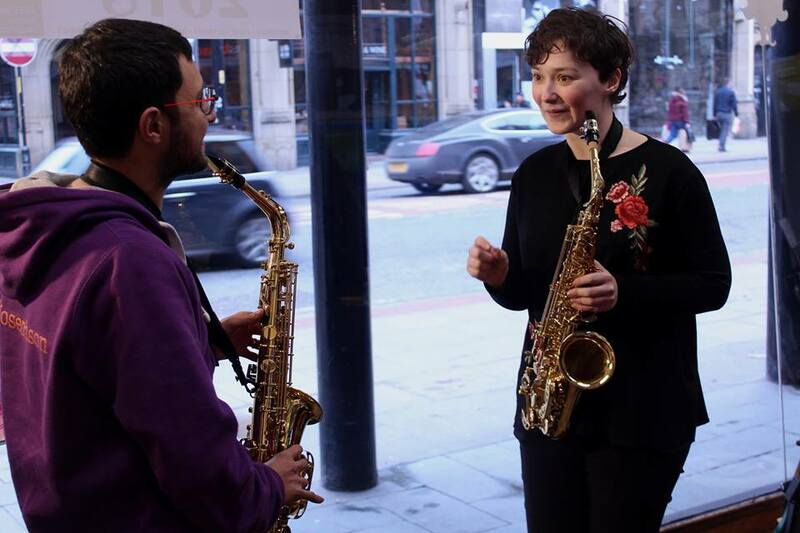 was a little different to previous ones: the focus was on 'non-classical' genres – jazz, blues, show tunes, light music and pop – and all attendance contributions were donated to the Royal Manchester Children's Hospital Charity in support of their music therapy project. Angela, a representative of RMCH as well as a regular member of Let's Play the Piano!, was on hand to discuss the charity's work and to take receipt of the group's fantastic donation of £276. 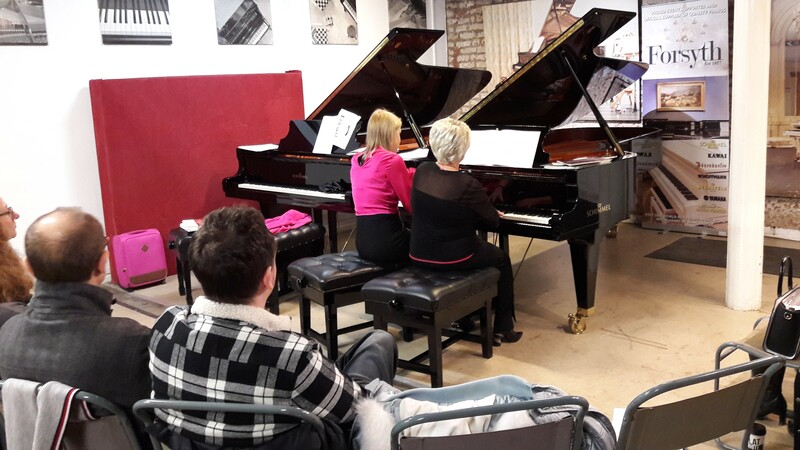 A tremendously fun afternoon for local pianists doing what they love for a wonderful cause! 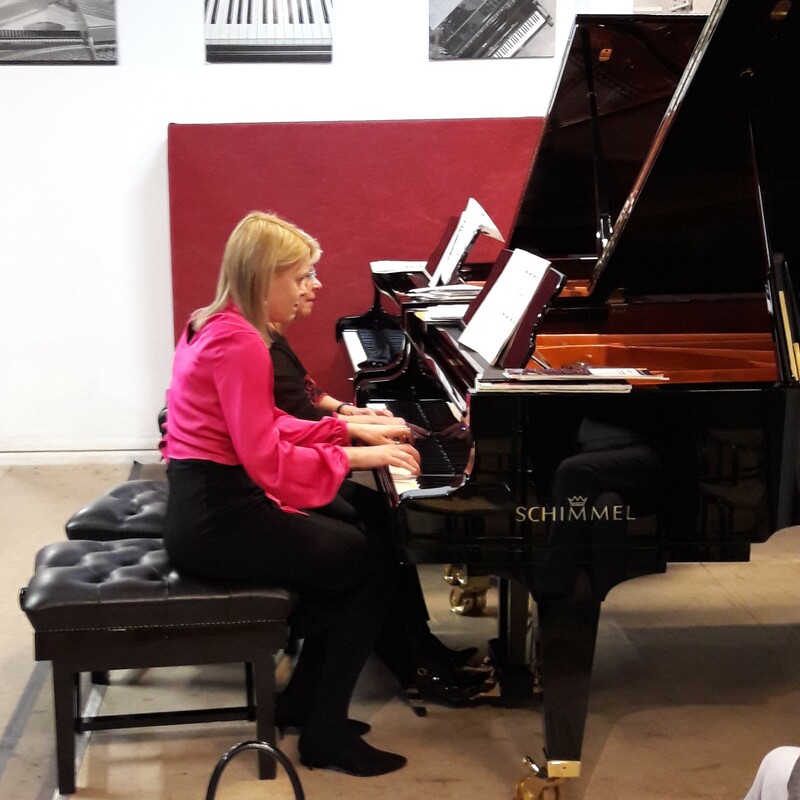 We were delighted to see Susan Bettaney back at Forsyth for our first European Piano Teachers Association (EPTA) workshop of the year. 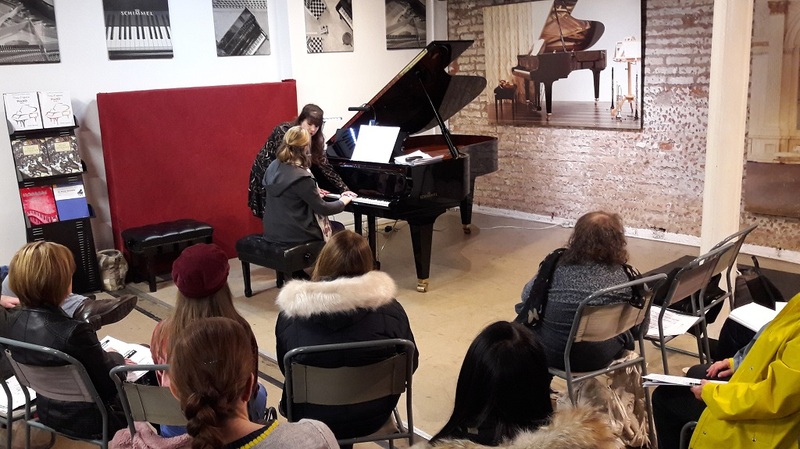 The all-day in-store event provided young and amateur pianists with invaluable insights and performance experience on one of our glorious Schimmel Konzert grands in front of a lovely audience! A wonderfully entertaining evening with Murray McLachlan and Marcus Blunt to celebrate the launch of their latest CD, Marcus Blunt: Orchestral Works, on the Divine Art label. The disc features Murray's recording of Marcus's Piano Concerto with Manchester Camerata as well as other orchestral works by Marcus, including his Concertino for Bassoon, with soloist Lesley Wilson and conducted by Stephen Threlfall, both of whom were among the capacity audience. Murray, a great champion of Marcus's work, spoke with passion about Marcus's beautiful, distinctive and 'celestial' harmonic language, illustrated with masterful performances of two solo piano pieces from their earlier collaboration, Aspirations. Conductor Stephen Threlfall also spoke about how Marcus managed to convey original musical ideas in concise, comprehensible forms with such idiomatic writing for each instrument that his music was a joy for him and the orchestra to prepare and perform. Marcus worked in our Instrument Department back in the early 70s before going on to a successful career as both composer and woodwind teacher. He joined us for the evening from Scotland with his family. Murray, on the other hand, came from just down the road at Chetham's School of Music, where he is Head of Keyboard in addition to his world-renowned activities as pianist, adjudicator and writer. The second half of the evening was concerned with the art of transcription: Murray played two of his own compositions based on works by Rachmaninov, newly published by Spartan Press, and Busoni, a two-piano work performed with his wife, Kathryn Page. He discussed how he considered that such works, while drawing on music of the past, ought also to be forward-looking. As such, these two pieces are dedicated to several of his students, the next generation of pianists, and are rich in unusual technical and timbral details requiring special study. Blending music and speech in a way that is interesting and accessible to both the specialists and the non-specialists among the audience is something that few musicians do well but Murray does with apparent ease. Many of the audience stayed afterwards to show their appreciation, have CDs and publications signed and take photos. Above (left to right): Murray McLachlan, Kathryn Page, Marcus Blunt, Maureen Blunt and Lesley Wilson. 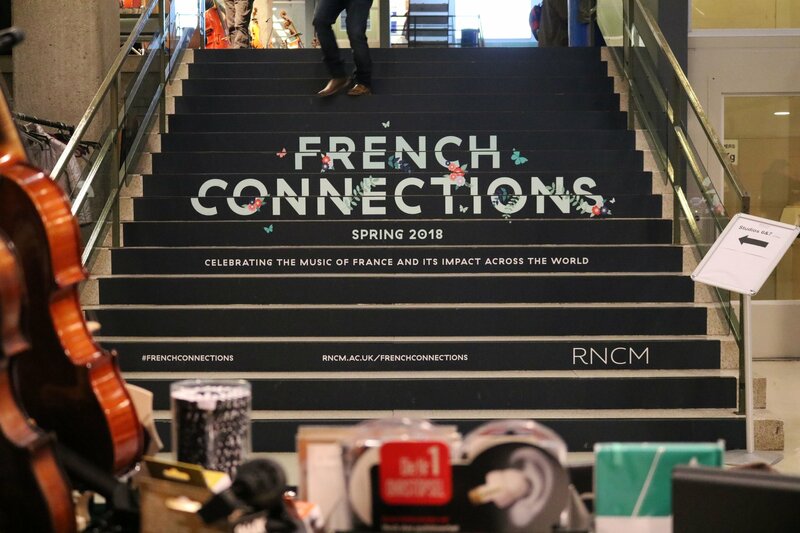 The RNCM’s prestigious annual event dedicated to bowed strings, guitar and harp was focused this year on British and French music. 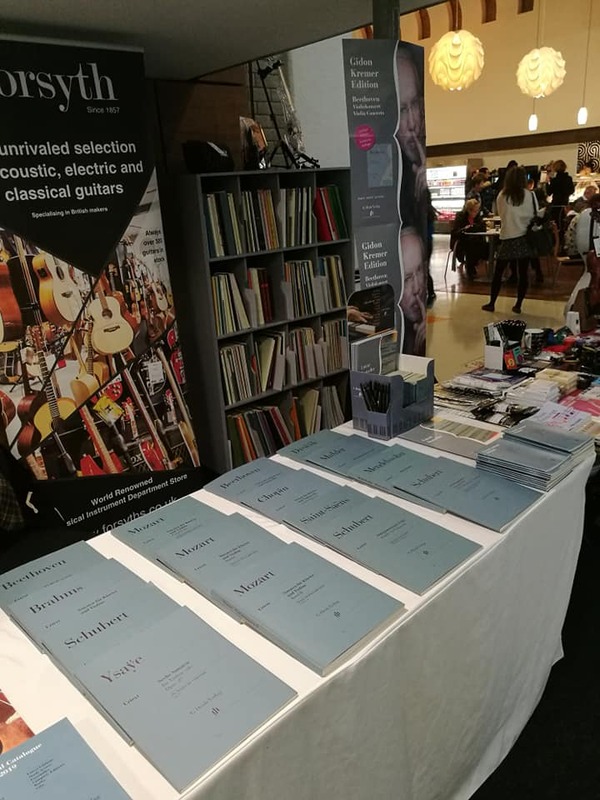 We collaborated with leading international publishers Bärenreiter and Edition Peters to offer a wide range of solo, chamber and educational publications as well as a selection of string instruments, accessories and gifts, all available for sale as part of the exhibition on the RNCM concourses. For further information about the festival, see the official website here! For some time now we have been the oldest independent business in Manchester and this was our 160th Christmas in the city! As part of our anniversary celebrations, we combined our annual Christmas Shopping Weekend with Small Business Saturday, the nationwide campaign to encourage all of us to get out on the high street and support the small businesses in our communities. In this spirit, we teamed up with Metrolink and our favourite local deli, Katsouris, to offer discounts and free Sunday lunches to those visiting town to purchase instruments in-store, in addition to our ever-popular annual rounds of complimentary mulled wine, mince pies and live music! 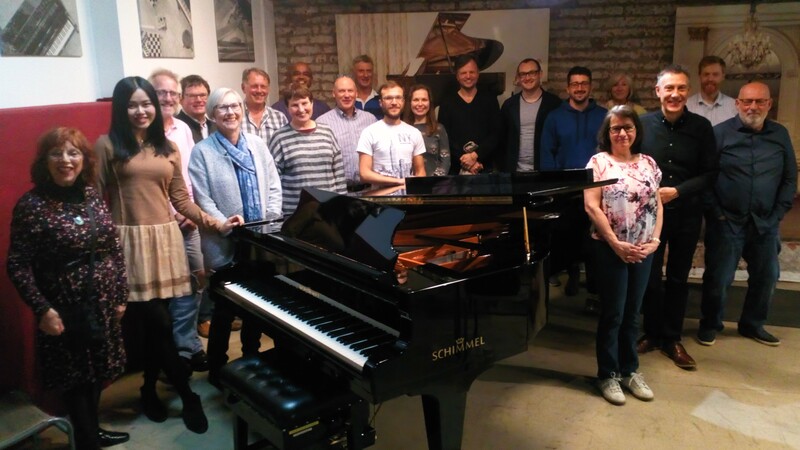 The most recent sessions of the Meetup group featured excellent performances of works for one or two players on one or two pianos by such varied composers as Bartók, Blumenfeld, Chopin, Finzi, Bear McCreary, Mendelssohn, Scarlatti, Schulhoff and Nobuo Uematsu. 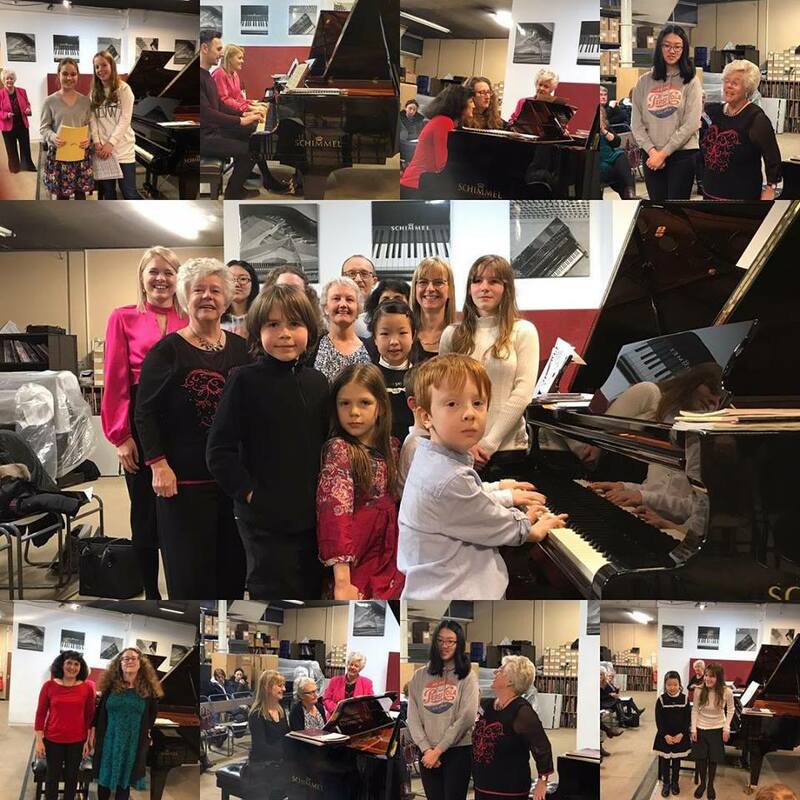 It's always a pleasure to welcome Susan Bettaney of the European Piano Teachers Association (EPTA) to Forsyths for one of her popular and inspiring workshops, providing young pianists and adult amateurs with the opportunity to perform to a supportive audience and to benefit from Susan's advice and encouragement. 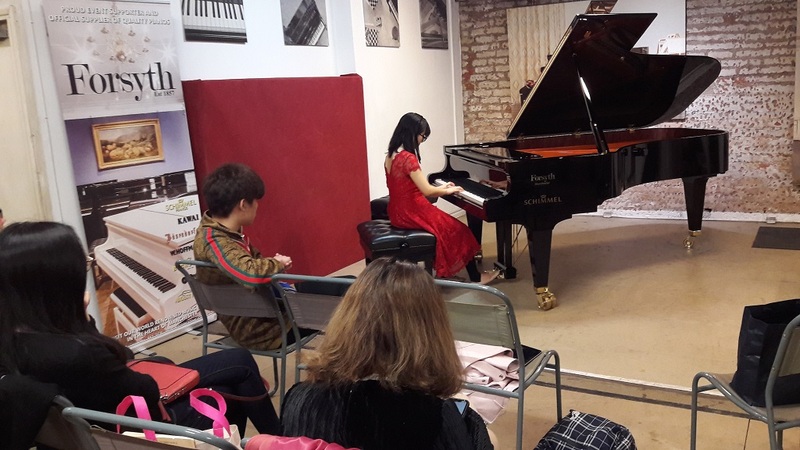 This session also featured a short recital and talk on "Contemporary Chinese Piano Pieces for Teaching and Performing" by Susan Chan, on tour from Canada, where she gives regular workshops and masterclasses, including an adult performance group to support late starters such as herself. 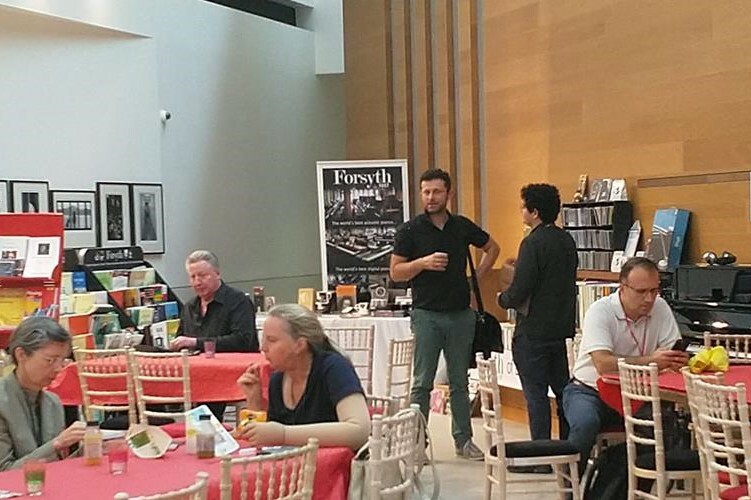 For the 10th year, Forsyth is proud to have sponsored the Chetham’s International Summer School and Festival for Pianists. 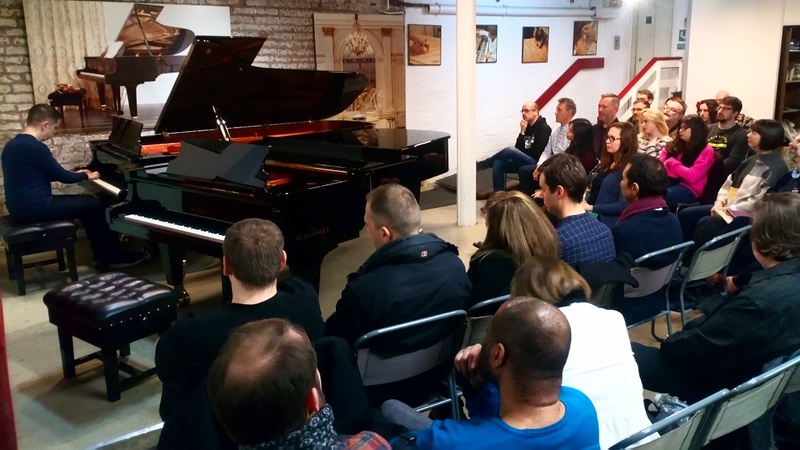 We provided 18 top-quality Schimmel, Yamaha and Kawai pianos for masterclasses, teaching and practice – including seven grand pianos! – as well as an extensive pop-up sheet music and recordings shop within the school. At our permanent five-storey premises on Deansgate in the city centre – only a 10-minute walk from Chetham’s – we also took participants and members of EPTA (the European Piano Teachers Association) on behind-the-scenes tours of our piano workshops, offering a rare and fascinating insight into the inner workings of pianos, how they are serviced by our on-site team and the differences between makers. The ever-expanding Meetup group Let's Play the Piano returned to Forsyth for two further sessions in July and August. The July event featured extended performances by its more experienced members, including Chris, Bob, David and Vera (pictured below), on our very special 9-foot Schimmel K219 grand piano. Between them, they presented works by Chopin, Debussy, Grieg, Liszt, Rachmaninov and Schumann, and introduced many of us to the Armenian composers Abramian and Bagdasarian. At the August event, all members were invited to play – regardless of ability, experience or musical style – or just to listen. 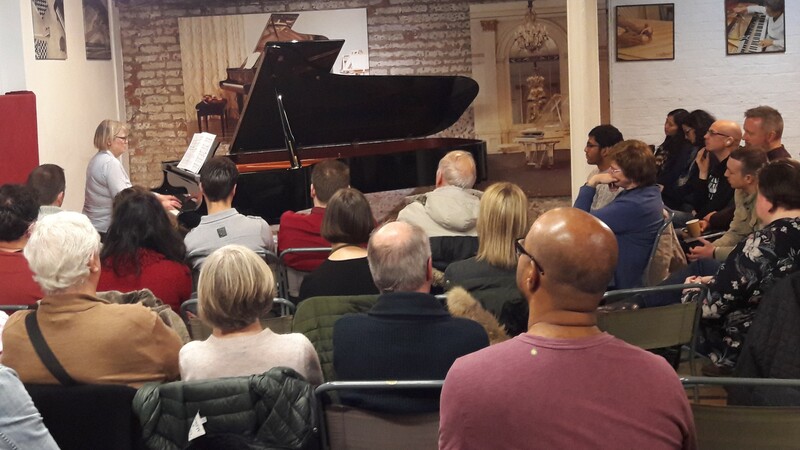 The programme included everything from vintage Bach to current chart hits as well as original compositions by the performers, all shared with a friendly and enthusiastic audience of new and existing members. 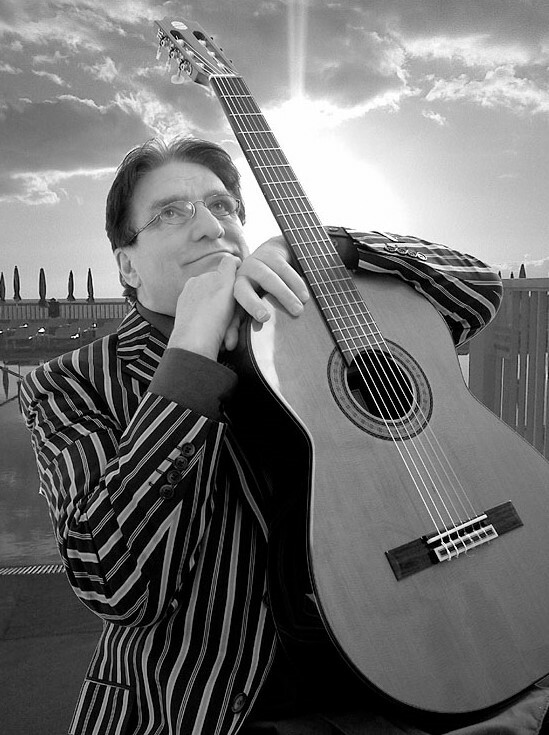 In these two taster sessions, experienced guitarist and teacher Will Halligan provided an introduction to playing the classical guitar and its enormously varied repertoire, which encompasses not only classical music, but also jazz, blues and even folk, rock and pop. 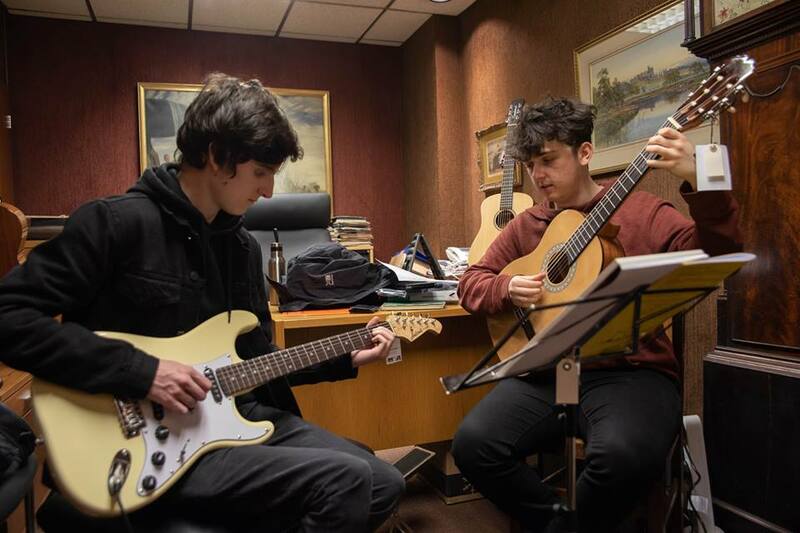 Both sessions provided opportunities to participate using our fantastic range of instruments and included demonstration performances of selections from the wide range of music suitable for classical guitar by Will and two of his advanced students. 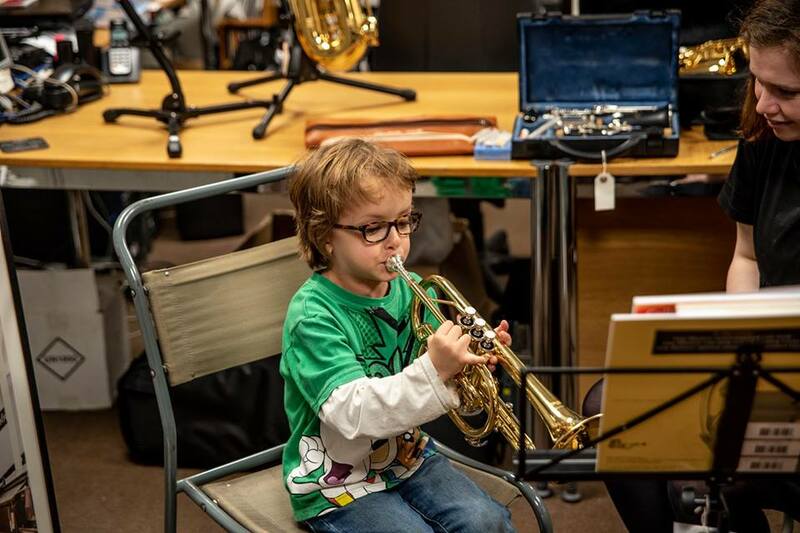 Learn to Play Day is a nationwide event encouraging people all around the UK to take up an instrument, or to return to an instrument they used to play. It has been organised annually since 2012 by the charity Music for All and is supported by the likes of Aled Jones, Gareth Malone OBE, Gordon Giltrap and patron Jools Holland. 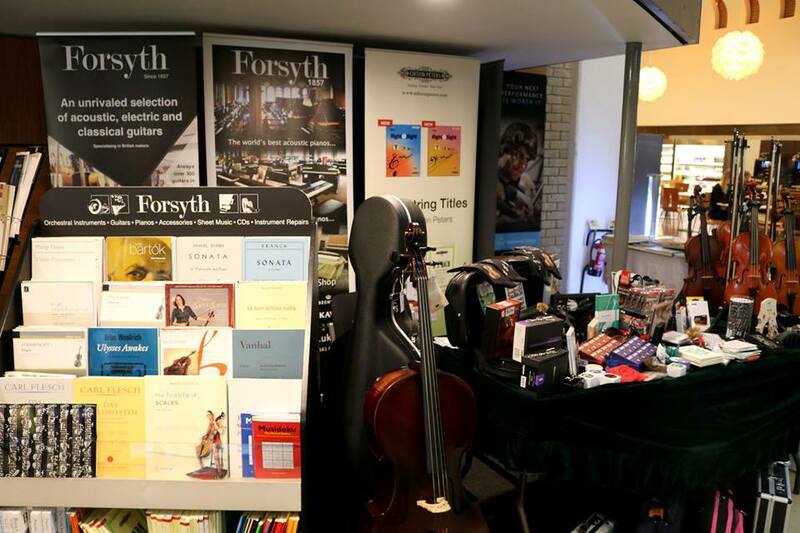 Here at Forsyth we were delighted to host another fun weekend open to everyone who wanted a free taster lesson on a musical instrument. We were fortunate to have a roster of inspiring volunteer teachers – Forsyth staff, local teachers and students from The Royal Northern College of Music among others – to give motivating introductory lessons on Piano, Guitar, Bass Guitar, Ukulele, Recorder, Flute, Oboe, Clarinet, Saxophone, Bassoon, French Horn, Trumpet, Cornet, Trombone, Violin, Viola, Cello, Double Bass and Harp. 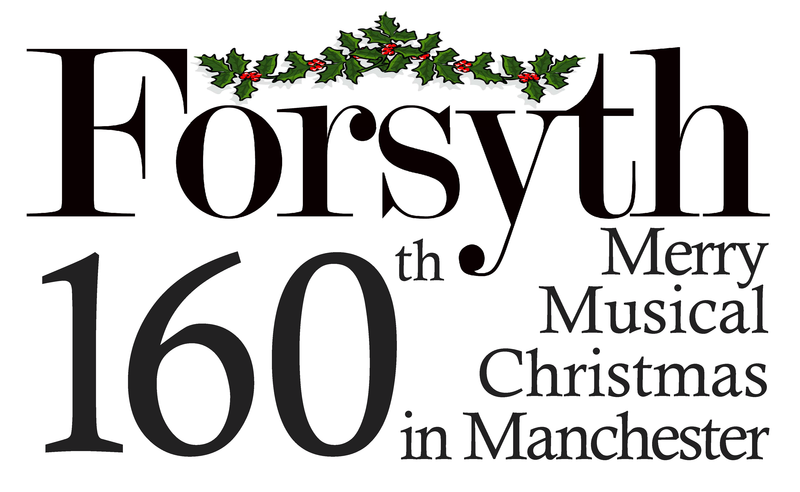 We are already looking forward to hosting the event next year: we'll post the dates as soon as they are announced, but if you would like to register your interest in a lesson on a particular instrument, please get in touch with us via 0161 834 3281 (extension 204) or learntoplay@forsyths.co.uk. 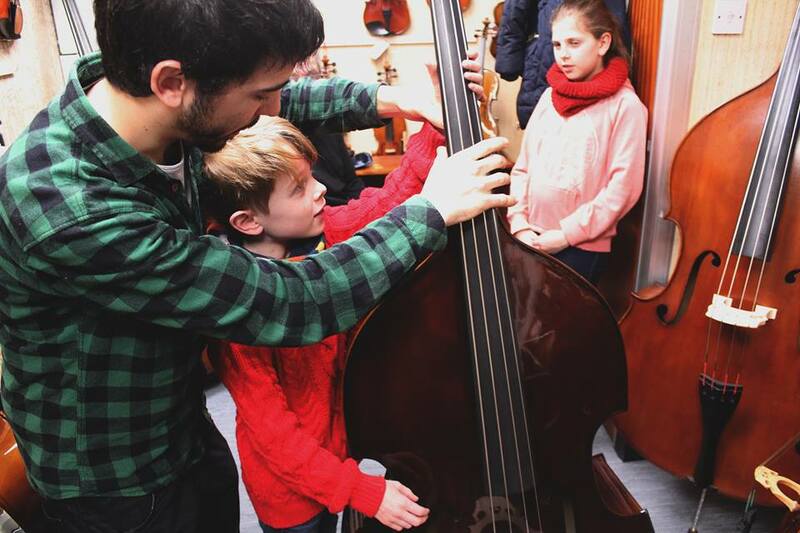 In the meantime, we're always happy to demonstrate and let you try instruments in our shop, and we hold a series of other introductory and more advanced workshops throughout the year: just keep an eye on our Events pages! 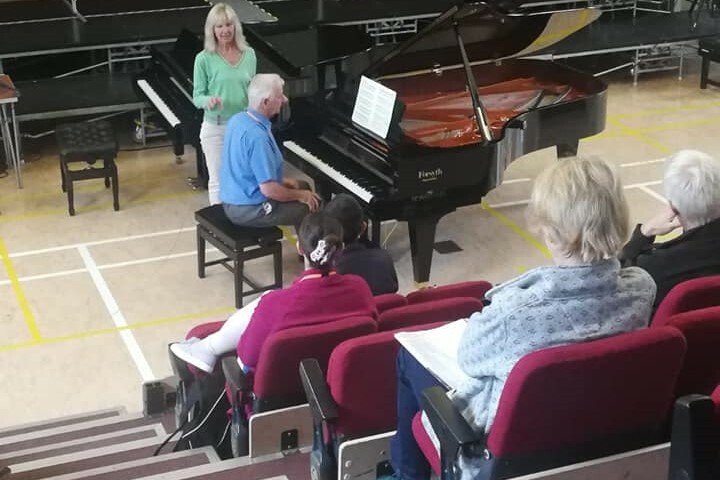 The wonderful Susan Bettaney returned to host her latest free workshop for the European Piano Teachers Association (EPTA). 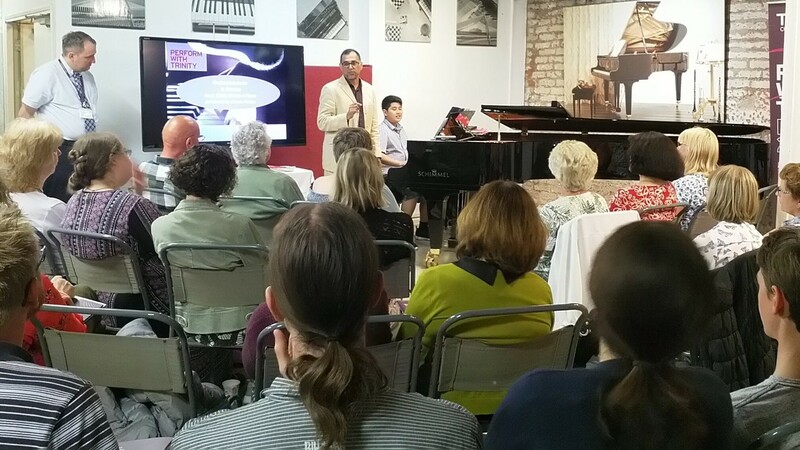 This workshop was for young pianists and adult amateurs to gain experience of performing in front of a supportive audience. 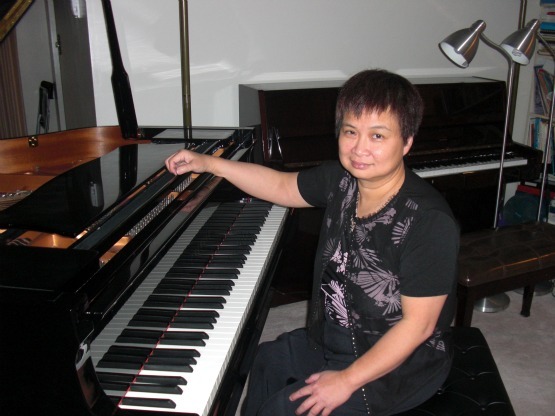 The next EPTA event at Forsyth will be 'Contemporary Chinese Piano Pieces for Teaching and Performing' presented by Susan Chan on Sunday 3 September 2017. 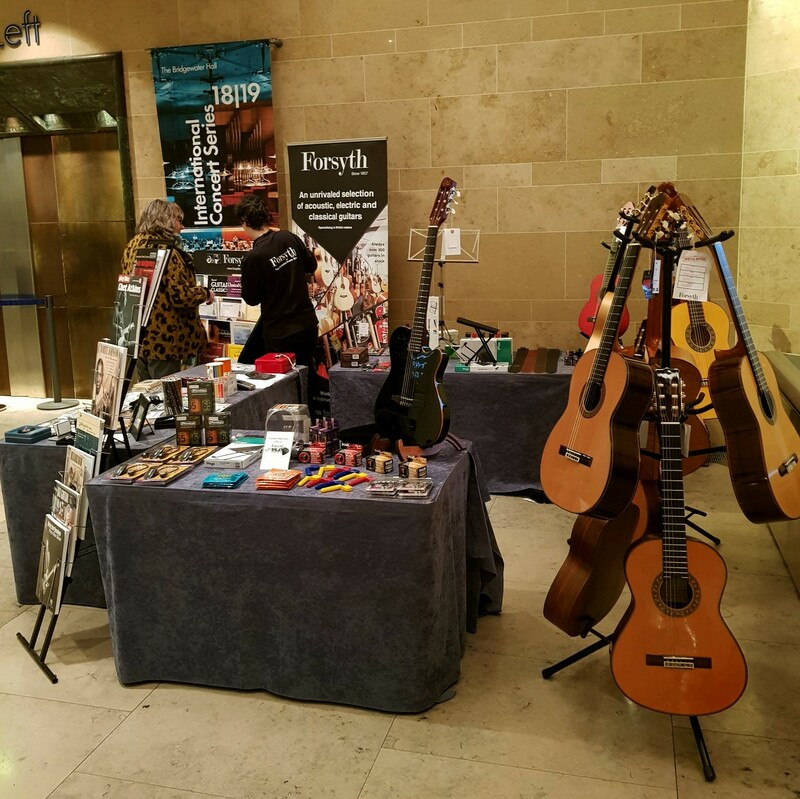 We were delighted to be invited back to exhibit our extensive selection of ukuleles, sheet music and all things ukulele at this year's Grand Northern Ukulele Festival in Huddersfield. As ever, it was a brilliant weekend of fun and a great opportunity for ukulele enthusiasts to enjoy meeting each other. 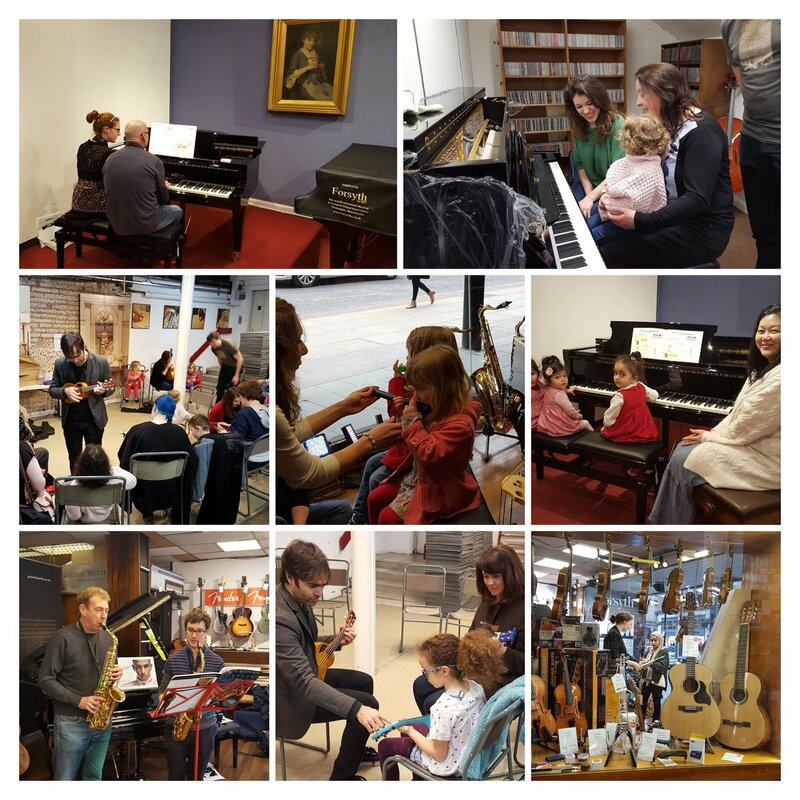 We were delighted to welcome Ben Richards and his Meetup group Let's Play The Piano! to Forsyth for their first session at Forsyth. 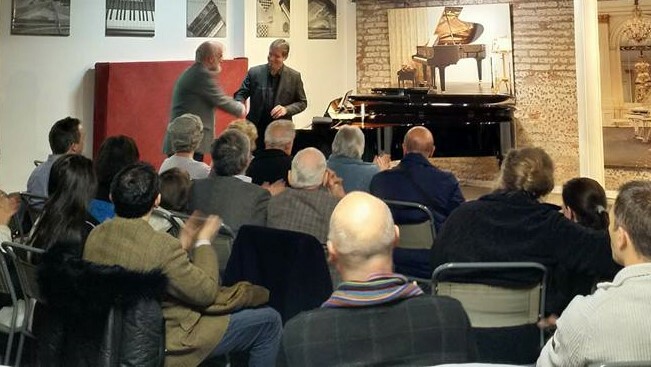 It was the latest in their popular series of events, which provide invaluable opportunities for adult pianists to perform – and for music-lovers to hear – a wide variety of music in a friendly, supportive environment. They are set to be regular guests with events here every couple of months so keep an eye on our Events pages! We were excited to welcome Mike Jackson - author of the Uke'n Play Ukulele series and one of the most popular Australian children’s entertainers and music educators - for a very special free ukulele workshop, in which he had an enthusiastic capacity crowd of all ages from 4 to 'mature' playing along with him in only 40 minutes! To raise money for the Motor Neurone Disease Association (MNDA) in memory of her mother Bernadette, who passed away last year after battling with MND, Emily announced she would be shaving her head. And having reached her £750 target, it took place right here in Forsyth's shop window! Her hair was donated to the Little Princess Trust, which makes wigs for children suffering with illnesses that cause hair loss. You can read her story on her JustGiving page and watch the video here! For many of us, improvisation is shrouded in mystery: either you can do it or you can’t. But like every other facet of music-making, it is simply a skill acquired and developed gradually over time with experience and guidance. 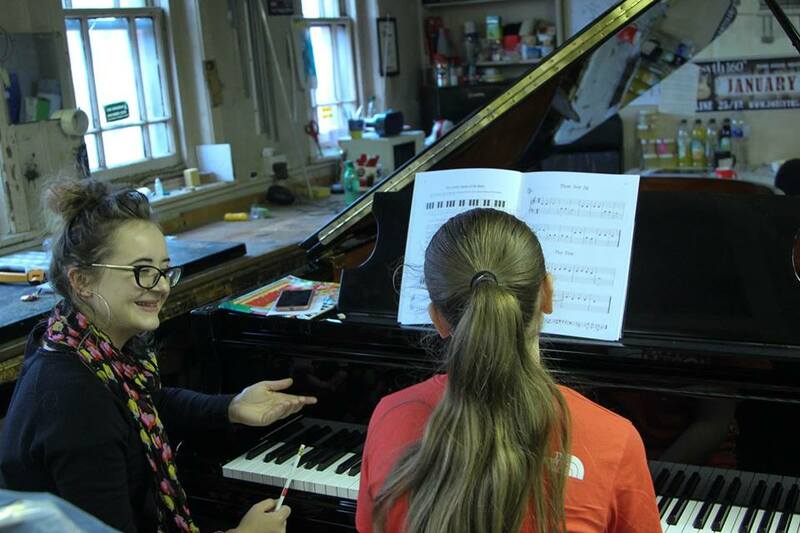 Improvisation can be learned – and it can be taught. We invited our customers to come and find out how! We are very grateful to Elena Cobb and Andrew Higgins for spending the day with us and inspiring so many people to shed their inhibitions and start improvising. 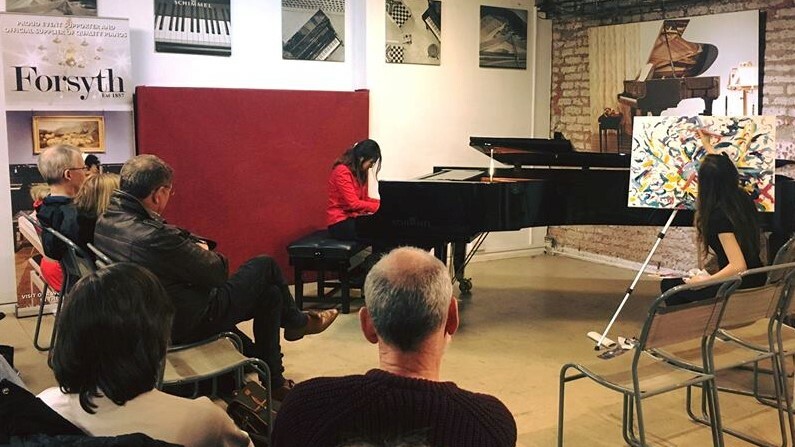 Two of the UK’s finest practitioners in this field, Elena and Andrew are both pianists and teachers who believe that improvisation is not a specialist activity for a few advanced musicians but an essential part of everyone's musical development from the outset. 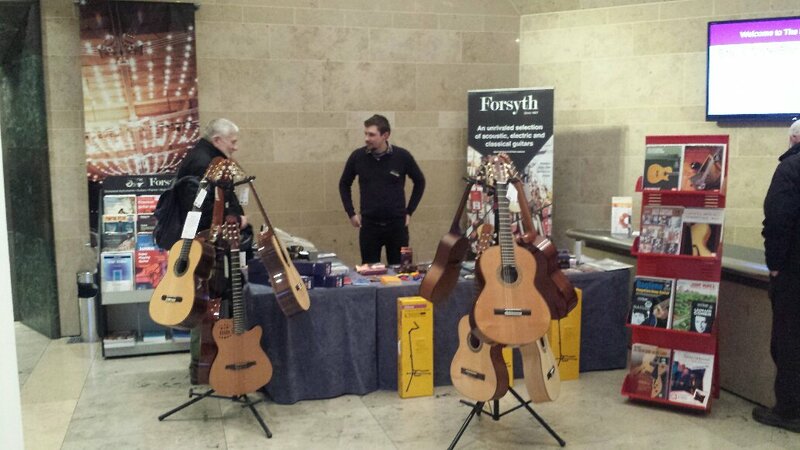 We were delighted to be asked back to take part in the Craig Ogden Guitar Weekend at the Bridgwater Hall in Manchester. Hundreds of guitar enthusiasts gathered to listen and take part in a weekend of guitar concerts, workshops and talks. This year our Christmas Shopping Weekend coincided with Small Business Saturday, the national campaign to encourage all of us to get out on the high street and support the small businesses in our communities. Many customers came ad enjoyed live music, complementary mulled wine and mince pies as well as in-store discounts. Watch out for a similar event in the run up to next Christmas! 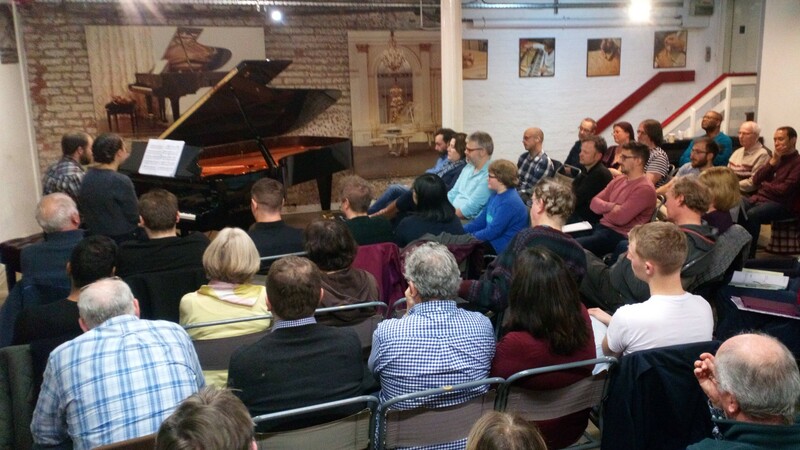 We hosted a free workshop at Forsyths by the European Piano Teachers Association (EPTA) on 19th November. 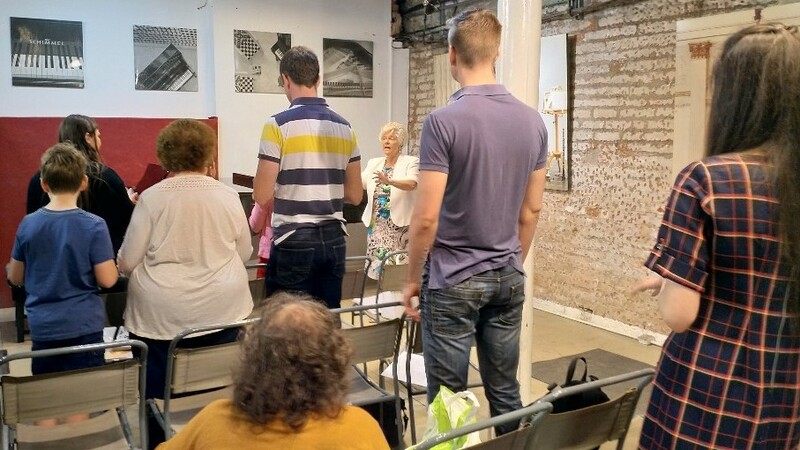 This workshop was for 'Young Performers' to help with their performance in front of an audience and to gain friendly helpful advice on their performance from Susan Bettaney. 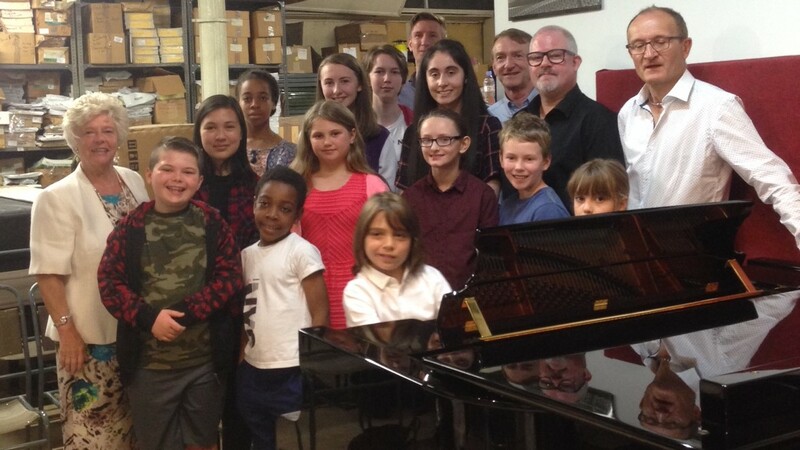 Players had the opportunity to perform on a Schimmel grand piano as part of this participative workshop. Our workshops with Anthony Williams discussed the musical awareness and skills a musician needs to support and enhance musical progress and independence. He explain the relevance of assessing aural, sight reading and scales and explore teaching strategies and technology that can be used to enhance an instrumental/vocal lesson or a student’s practice. The workshop was so popular with teachers and students alike we ended up running the session twice to capacity crowds. We hope to be doing something similar with the ABRSM in 2017 - watch out for details! 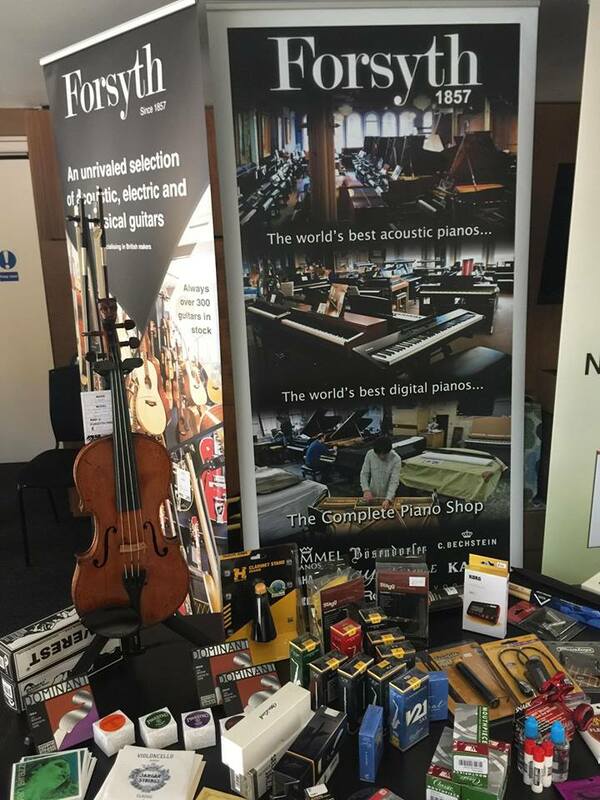 We were delighted to be supporting the Chethams' Piano Summer School for the 9th year by providing a dedicated sheet music and recordings shop at the School as well as sponsoring the school by providing 12 top quality Schimmel, Yamaha and Kawai pianos for master classes, teaching and practice rooms. 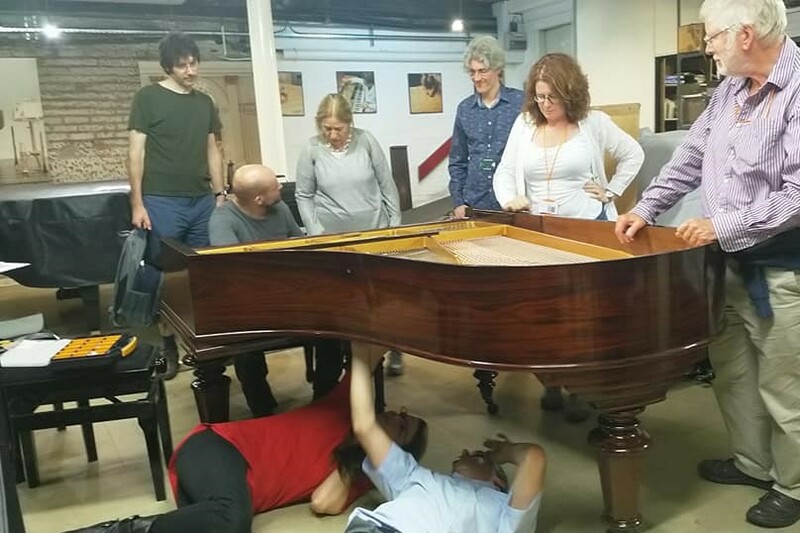 We also provided behind the scenes tours of our piano workshops on the 18th and 24th of August for participants which were well attended and lasted much longer than we anticipated given the interest and enthusiasm of the participants. Chethams' Piano Summer School has grown into an internationally recognised centre of excellence for teaching and performance. The enthusiasm of the participants and staff is infectious - so much so that many participants come back year after year. The star studded faculty of teachers speaks for itself. Take a look at the Summer School's website for further information Chethams' Piano Summer School 2016. 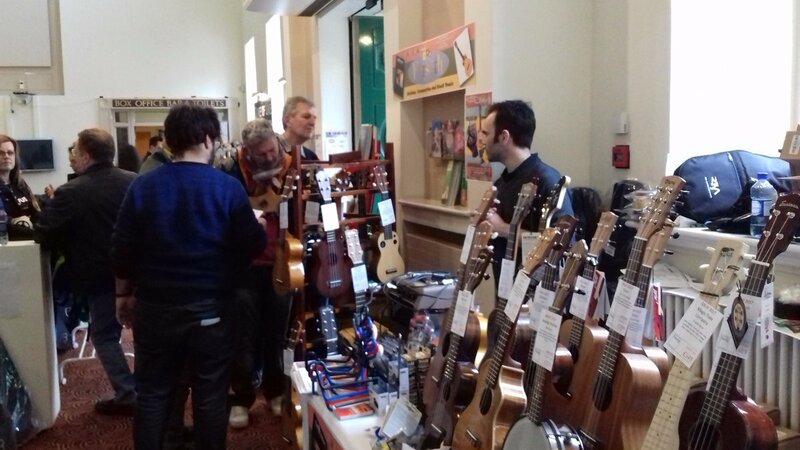 We were delighted to have been invited to bring an all things 'Ukulele music shop' to the Grand Northern Ukulele Festival in Huddersfield again. It was a fun, if exhausting weekend with lots of interest in our wide range of stock from books to vintage ukuleles! We'll be back again next year so keep your eyes open for further details on the event website. Thank you to everyone who came to Learn to Play Day at Forsyths on Saturday. 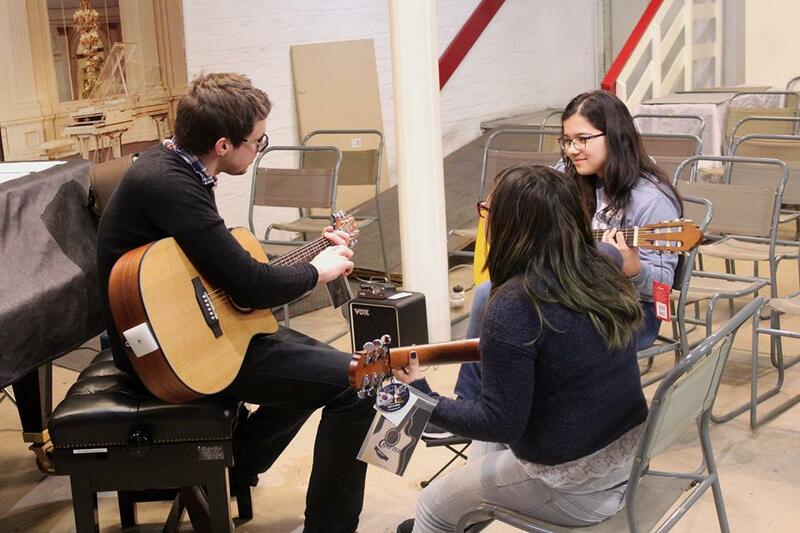 It was a great success with over 80 individual lessons given as well as two group ukulele sessions. We'd also like to thank all the University of Manchester students who came to help with the teaching - we couldn't have done it without you! It was really quite an inspirational event - marvellous to give the opportunity to such a wide range of enthusiastic people and hopefully inspire some to carry on with learning a new instrument. Learn to Play Day is a national initiative encouraging everyone to take up a new instrument regardless of age and musical experience. 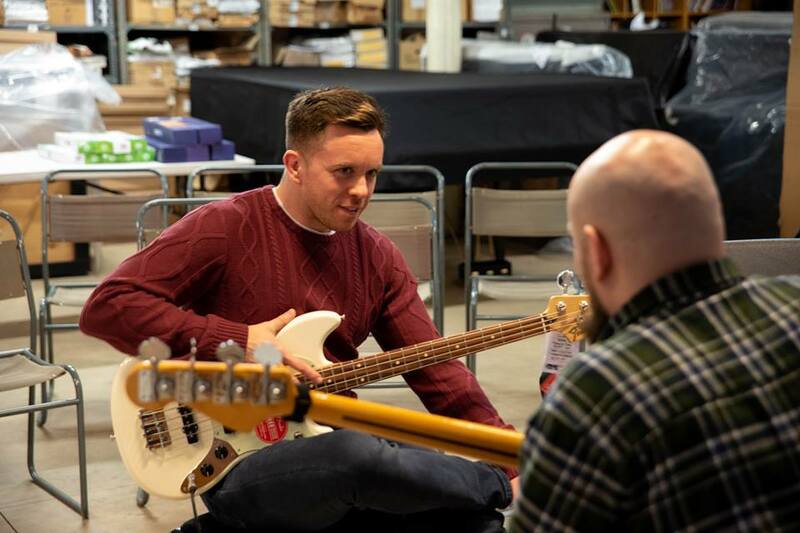 Music shops throughout the UK are throwing open their doors to give everyone an opportunity to try a new instrument. Here at Forsyths this was our third year taking part. 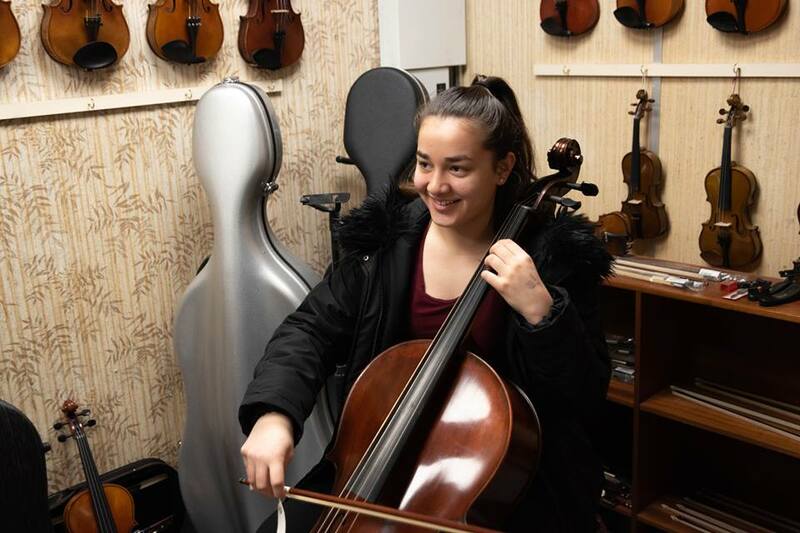 It is an exciting and busy day with lots going on throughout the store with lots of our offices and store rooms temporarily being co-opted as instrument teaching rooms. 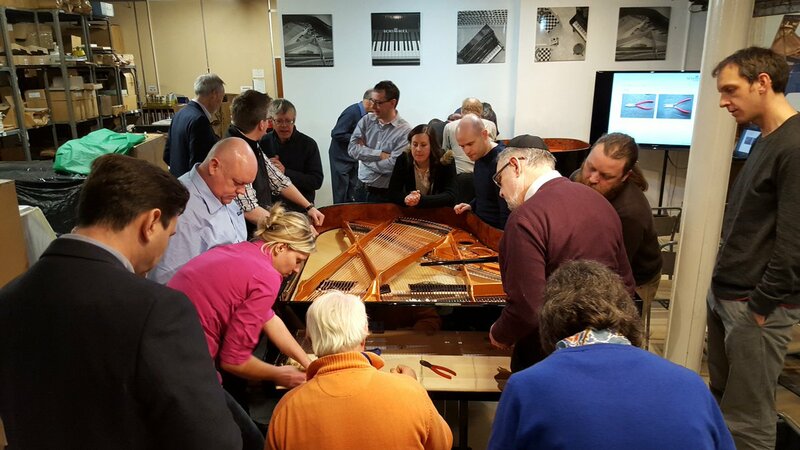 We were delighted to welcome 18 piano technicians from throughtout the UK to find out more about Schimmel pianos and learn in a hands on workshop about the practical challenges of fitting and regulating dampers in grand pianos.